There is no close link (if any) among the Gardner settlers Josiah, Samuel, Simon, and William B Stone. Martha was the brother of settler Josiah Wilder. Her ancestry can be seen on his page. 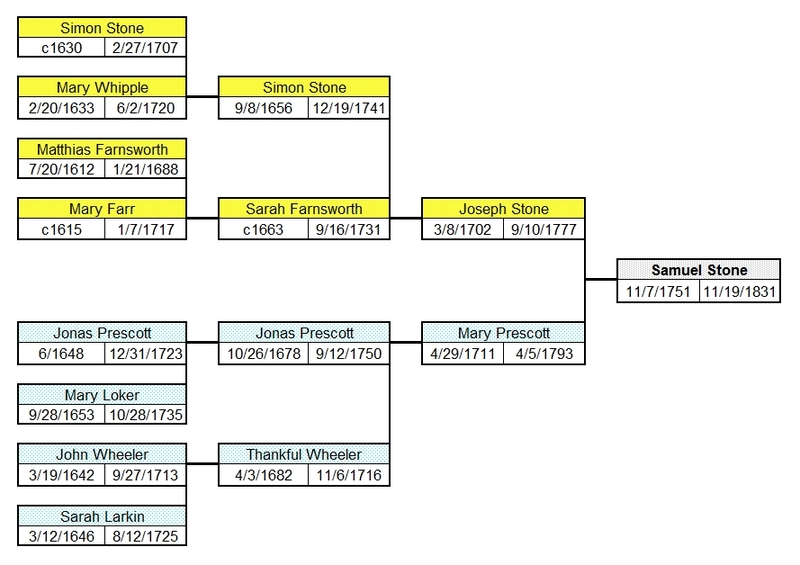 Descendants of Samuel Stone, including sons Benjamin and Abram. 1. SAMUEL4 STONE (JOSEPH3, SIMON2, SIMON1) was born 07 Nov 1751 in Groton MA, and died 19 Nov 1831. He married MARTHA WILDER 31 May 1777 in Winchendon MA, daughter of JOSIAH WILDER and MERIAM GATES. She was born 21 Apr 1756 in Lancaster/Sterling MA, and died 02 Sep 1846 in Gardner MA. 2. i. EUNICE5 STONE, b. 17 Mar 1778, Winchendon MA; d. Aft. 1860. 3. ii. SAMUEL STONE, b. 30 Jun 1779, Winchendon MA; d. 06 Feb 1845, Pittsfield OH. 4. iii. JOSEPH STONE, b. 08 Jun 1781, Winchendon MA; d. 15 Mar 1856, Peru VT.
5. iv. JOSIAH STONE, b. 22 Apr 1783, Winchendon MA - of Peru VT; d. 03 Jul 1848, Pittsfield OH. 6. v. MARTHA STONE, b. 26 Dec 1786, Gardner MA; d. 04 Nov 1868, Leominster MA. 7. vi. BENJAMIN STONE, b. 20 Jan 1789, Gardner MA; d. 20 Oct 1859, Gardner MA. 8. vii. OLIVER STONE, b. 20 Jan 1789, Gardner MA; d. 31 Aug 1874, Gilsum NH. 9. viii. MARY STONE, b. 28 Feb 1791, Gardner MA; d. 14 Jul 1814, Ashby MA. 10. ix. ABRAHAM STONE, b. 29 Dec 1792, Gardner MA; d. 20 Sep 1854, Wilbraham MA. 11. x. DIADAMIA STONE, b. 17 Mar 1795, Gardner MA; d. 09 Jul 1878, West Boylston MA. xi. SON STONE, b. Abt. Nov 1796; d. Abt. 19 Nov 1796, Gardner MA. 12. xii. MERRIAM STONE, b. 13 Jul 1799, Gardner MA; d. Aft. 1860. 2. EUNICE5 STONE (SAMUEL4, JOSEPH3, SIMON2, SIMON1) was born 17 Mar 1778 in Winchendon MA, and died Aft. 1860. She married ISRAEL STONE, son of ISRAEL STONE and SARAH ?. He was born 26 Oct 1770 in Sudbury MA, and died 07 Nov 1841 in Wayland MA. 13. i. NELSON6 STONE, b. Mar 1812, Wayland MA; d. 25 Oct 1905, Wareham MA. 14. ii. ANDREW JACKSON STONE, b. Abt. 1815, Wayland MA; d. 01 Jun 1899, Framingham MA. iii. SIMON (PAUL) STONE, b. Abt. 1817, MA; d. Bet. 1865 - 1900; m. JERUSHA C MORSE, 15 Nov 1844, Hopkinton MA; b. 15 Nov 1820, Hopkinton MA; d. 11 Dec 1902, Hopkinton MA. 3. SAMUEL5 STONE (SAMUEL4, JOSEPH3, SIMON2, SIMON1) was born 30 Jun 1779 in Winchendon MA, and died 06 Feb 1845 in Pittsfield OH. He married SUSANNAH HAYNES 18 Feb 1802 in Gardner MA, daughter of REUBEN HAYNES and SUSANNA WILLIS. She was born 16 Nov 1778 in Gardner MA, and died 04 Sep 1842 in or aft 1850?? Pittsfield OH. 15. i. JOSEPH6 STONE, b. Abt. 1819, NY - parents assumed; d. 26 Jul 1856, Pittsfield OH. 4. JOSEPH5 STONE (SAMUEL4, JOSEPH3, SIMON2, SIMON1) was born 08 Jun 1781 in Winchendon MA, and died 15 Mar 1856 in Peru VT. He married POLLY STILES, daughter of EBENEZER STILES and SARAH KILLAM. She was born 07 May 1796 in VT, and died Oct 1879.
i. HARVEY6 STONE, b. 03 Jun 1830, Peru VT; d. 18 Aug 1905, VT; m. JULIA A SHELDON, 14 Nov 1901, VT; b. Abt. 1835, Andover VT; d. Aft. 1901.
ii. HEZEKIAH STONE, b. 19 Dec 1834, Peru VT; d. 23 Apr 1905, VT.
iii. LEONORA STONE, b. 02 Jan 1837, VT; d. Aft. 1880. 5. JOSIAH5 STONE (SAMUEL4, JOSEPH3, SIMON2, SIMON1) was born 22 Apr 1783 in Winchendon MA - of Peru VT, and died 03 Jul 1848 in Pittsfield OH. He married EUNICE HAYNES 15 Mar 1812 in Gardner MA, daughter of REUBEN HAYNES and SUSANNA WILLIS. She was born 06 Apr 1787 in Gardner MA, and died 03 Dec 1838 in Pittsfield OH. 16. ii. REUBEN STONE, b. Abt. 1812, Peru VT - parents assumed; d. 07 Sep 1884, Oberlin OH. iii. MARY STONE, b. Abt. 1813, Peru VT.
iv. JOSIAH STONE, b. Abt. 1815, [12/11/1814??] Peru VT; d. May 1827, Peru VT.
v. BETSEY STONE, b. Abt. 1819, parents assumed; d. 1842; m. JAMES RUGGLES WARD; b. Sep 1814, VT - father assumed; d. 11 Jan 1904, Pittsfield OH. 6. MARTHA5 STONE (SAMUEL4, JOSEPH3, SIMON2, SIMON1) was born 26 Dec 1786 in Gardner MA, and died 04 Nov 1868 in Leominster MA. She married (1) EZRA WILLIS HAYNES 24 Feb 1812 in Gardner MA, son of REUBEN HAYNES and SUSANNA WILLIS. He was born 22 Dec 1780 in Gardner MA, and died 02 Jan 1817 in Gardner MA. She married (2) ELISHA COOLIDGE 16 Jan 1822 in Gardner MA [int 12/29/1821 Leominster MA], son of ELISHA COOLIDGE and SARAH BOUTELL. He was born 19 Nov 1768 in Ashburnham MA, and died 29 Apr 1841 in Leominster MA. 17. i. REUBEN6 HAYNES, b. 03 Mar 1813, Gardner MA; d. 02 Feb 1892, Leominster MA/Stratham NH. 18. ii. MARY HAYNES, b. 23 Feb 1815, Gardner MA; d. 23 Oct 1896, Leominster MA. iii. MARTHA WILLIS HAYNES, b. 12 May 1817, Gardner MA; d. 23 Jan 1877, Leominster MA. 19. iv. JOHN WESLEY6 COOLIDGE, b. 22 Nov 1822, Leominster MA; d. 14 Oct 1889, Hancock NH. v. CHARLES WESLEY COOLIDGE, b. 29 Oct 1824, Leominster MA; d. 02 Mar 1828, Leominster MA. 7. BENJAMIN5 STONE (SAMUEL4, JOSEPH3, SIMON2, SIMON1) was born 20 Jan 1789 in Gardner MA, and died 20 Oct 1859 in Gardner MA. He married (1) SUSANNAH ROLPH in 1836-1850, daughter of SOLOMON ROLPH and SARAH WALKER. She was born 28 Mar 1791 in Princeton MA, and died 05 Dec 1870 in Gardner MA. He married (2) LUCY WHEELER 01 Dec 1814 in Gardner MA, daughter of JOEL WHEELER and DORCAS STEARNS. She was born 27 Jul 1789 in Gardner MA, and died 19 Sep 1836 in Gardner MA. i. LEONARD6 STONE, b. 31 Aug 1815, Gardner MA; d. 12 Sep 1818, Gardner MA. 20. ii. AI STONE, b. 25 Aug 1817, Gardner MA; d. 02 Oct 1877, Winchendon MA. iii. CALVIN STONE, b. 28 Nov 1819, Gardner MA; d. 18 Sep 1845, Gardner MA. 21. iv. ALBERT STONE, b. 30 Jun 1822, Gardner MA; d. 23 Jul 1854, Gardner MA. 22. v. LEONARD STONE, b. 03 Mar 1825, Gardner MA; d. Aft. 1885. 23. vi. SAMPSON STONE, b. 18 May 1827, Gardner MA; d. 31 Mar 1871, Chelsea VT.
24. vii. LUCY STONE, b. 28 Jan 1831, Gardner MA; d. 25 Jun 1887, Gardner MA. viii. JUDSON STONE, b. 26 Jul 1834, Gardner MA; d. 1856, Cuyahoga County OH. 8. OLIVER5 STONE (SAMUEL4, JOSEPH3, SIMON2, SIMON1) was born 20 Jan 1789 in Gardner MA, and died 31 Aug 1874 in Gilsum NH. He married BETSEY HOLT, daughter of JOEL HOLT and POLLY ?. She was born 06 Sep 1789 in Nelson NH, and died 12 Jan 1863 in Milford NH. 25. i. BRADLEY6 STONE, b. 06 Aug 1824, Sullivan NH; d. 24 Jun 1886, Gilsum NH. ii. CHILD STONE, b. Abt. 1827; d. 10 Apr 1827, Sullivan NH. 26. iii. MARY S STONE, b. 29 Apr 1828, Sullivan NH; d. 18 Nov 1884, Chicopee MA. iv. MIRANDA STONE, b. 01 May 1830, Sullivan NH. v. BETSEY STONE, b. 01 Mar 1832, Sullivan NH. 9. MARY5 STONE (SAMUEL4, JOSEPH3, SIMON2, SIMON1) was born 28 Feb 1791 in Gardner MA, and died 14 Jul 1814 in Ashby MA. She married JONAS PATCH 28 May 1813 in int Gardner MA. He was born Abt. 1790 in of Ashby MA, and died 12 Jan 1870 in Ashby MA. 27. i. MARY S6 PATCH, b. 03 Feb 1814, Ashby MA; d. 25 Nov 1877, Ashby MA. 10. ABRAHAM5 STONE (SAMUEL4, JOSEPH3, SIMON2, SIMON1) was born 29 Dec 1792 in Gardner MA, and died 20 Sep 1854 in Wilbraham MA. He married ABIGAIL LEAVITT BARRELL 20 May 1821 in Gardner MA, daughter of LUTHER BARRELL and ABIGAIL HUMPHREY. She was born 25 Jul 1795 in Scituate MA, and died 08 Mar 1864 in Wilbraham MA. 28. i. ABIGAIL6 STONE, b. 26 Jul 1822, Gardner MA; d. Aft. 1855. 29. ii. LYDIA STONE, b. 24 Oct 1824, Gardner MA; d. 14 Oct 1910, Templeton MA. iii. MARY STONE, b. 19 Aug 1832, Gardner MA. iv. ABRAHAM STONE, b. 15 Sep 1834, Gardner MA; d. Aft. 1850.
v. FANNY STONE, b. 02 Feb 1837, Gardner MA; d. Aft. 1855. 11. DIADAMIA5 STONE (SAMUEL4, JOSEPH3, SIMON2, SIMON1) was born 17 Mar 1795 in Gardner MA, and died 09 Jul 1878 in West Boylston MA. She married JOEL WALKER 28 Aug 1822 in [7/27/1822] Gardner MA, son of HEZEKIAH WALKER and LUCY RAYMOND. He was born 08 Apr 1798 in Holden MA, and died 01 Mar 1896 in West Boylston MA. 30. i. MIRIAM6 WALKER, b. 21 Aug 1824, Holden MA; d. 12 Feb 1861, West Boylston MA. 31. ii. EMILY WALKER, b. 14 Sep 1826, Holden MA; d. Aft. 1920.
iii. LOUISA W WALKER, b. 27 Feb 1828, Holden MA; d. 09 Jan 1889, West Boylston MA; m. HUBBARD GLIDDEN HURD, 19 Jun 1863, Sterling MA; b. Mar 1832, Lancaster NH; d. 06 Mar 1906, West Boylston MA. 32. iv. ALONA ALLEN WALKER, b. 04 Feb 1830, Holden MA; d. Aft. 1920. 33. v. LUCY WALKER, b. 11 Aug 1832, Holden MA; d. Aft. 1920.
vi. JOEL RAYMOND WALKER, b. 09 Sep 1834, Holden MA; d. Aft. 1855. 34. vii. ALVA STONE WALKER, b. 21 Apr 1836, Holden MA; d. Feb 1911, NY. 35. viii. MARTHA WILDER WALKER, b. 19 Jan 1838, Holden MA; d. 30 May 1863, Holden MA. ix. CHARLES HOWARD WALKER, b. 03 Nov 1841, West Boylston MA; d. Aft. 1855. 12. MERRIAM5 STONE (SAMUEL4, JOSEPH3, SIMON2, SIMON1) was born 13 Jul 1799 in Gardner MA, and died Aft. 1860. She married JOSEPH COMEE 27 Apr 1826 in Gardner MA, son of DAVID COMEE and HANNAH MALTMAN. He was born 14 Jan 1803 in Gardner MA, and died Aft. 1850. 36. i. CHRISTOPHER COLUMBUS6 COMEE, b. 28 Jan 1827, Gardner MA; d. Aft. 1900. 37. ii. SAMUEL S COMEE, b. 07 Jun 1830, MA; d. 17 Nov 1907, Minneapolis MN. 38. iii. MARTHA S COMEE, b. Abt. 1835, MA; d. Aft. 1895.
iv. GEORGE COMEE, b. Abt. 1838, MA; d. Aft. 1875. 13. NELSON6 STONE (EUNICE5, SAMUEL4, JOSEPH3, SIMON2, SIMON1) was born Mar 1812 in Wayland MA, and died 25 Oct 1905 in Wareham MA. He married DEBORAH HUMPHREY 03 Sep 1840 in Hopkinton MA, daughter of ASA HUMPHREY and MARY ?. She was born 16 May 1812 in Carver MA, and died 25 Sep 1902 in Wareham MA. 39. i. BAMAN NELSON7 STONE, b. 28 Jul 1841, Hopkinton MA; d. Aft. 1910. 40. ii. MARTHA JANE STONE, b. 18 Aug 1844, Wayland MA; d. 12 Feb 1914, Wareham MA. 41. iii. CATHERINE AUGUSTA STONE, b. 15 Dec 1846, Wayland MA; d. 23 Jan 1906, Athol MA. iv. HARRIET E H STONE, b. Abt. 1850, MA; d. Aft. 1870. 42. v. ALMON HUMPHREY STONE, b. Feb 1856, MA; d. Aft. 1940. 14. ANDREW JACKSON6 STONE (EUNICE5, SAMUEL4, JOSEPH3, SIMON2, SIMON1) was born Abt. 1815 in Wayland MA, and died 01 Jun 1899 in Framingham MA. He married HARRIET NEWELL COBB 21 May 1841 in int Wayland MA, daughter of LEMUEL COBB and POLLY ?. She was born Abt. 1815 in Plympton MA, and died 08 Apr 1898 in Framingham MA. 43. i. HENRY J7 STONE, b. 14 May 1843, Wayland MA; d. 09 Sep 1907, Cambridge MA. ii. ELIZA JANE STONE, b. 11 Oct 1844, Wayland MA; d. 26 Dec 1865, Malden MA. 44. iii. (HATTIE) ELLA MARIA STONE, b. 24 Jun 1855, Oxford MA; d. Aft. 1910.
iv. LAURA AMELIA STONE, b. 08 Jan 1857, Leicester MA. 15. JOSEPH6 STONE (SAMUEL5, SAMUEL4, JOSEPH3, SIMON2, SIMON1) was born Abt. 1819 in NY - parents assumed, and died 26 Jul 1856 in Pittsfield OH. He married ESTHER GIFFORD, daughter of CORNELIUS GIFFORD. She was born Mar 1818 in NY, and died 08 Mar 1911 in Hutchinson MN. i. EMMERSON7 STONE, b. Abt. 1842, OH; d. Aft. 1860. 45. ii. ELMER JOSEPH STONE, b. 08 Jan 1844, OH; d. 05 Apr 1914, McLeod County MN. 46. iii. MARY ANN STONE, b. 25 Sep 1847, Pittsfield OH; d. 22 Feb 1936, Hutchinson MN. 47. iv. SHELDON C STONE, b. Nov 1849, OH; d. 01 Apr 1939, McLeod MN. v. EGBERT S STONE, b. Abt. 1852; d. 18 Dec 1853, Pittsfield OH. 48. vi. JULIA ESTHER STONE, b. 23 Oct 1854, Pittsfield OH; d. 10 Mar 1931, McLeod County MN. 16. REUBEN6 STONE (JOSIAH5, SAMUEL4, JOSEPH3, SIMON2, SIMON1) was born Abt. 1812 in Peru VT - parents assumed, and died 07 Sep 1884 in Oberlin OH. He married (1) HANNAH WHITNEY. She was born Abt. 1812 in Peru VT, and died Mar 1873 in Oberlin OH. He married (2) JOSEPHINE A NEWTON 01 Dec 1879 in Lorain OH. She was born Abt. 1826 in CT, and died Aft. 1880. 49. i. FRANKLIN7 STONE, b. Abt. 1835, Pittsfield OH; d. 05 Jun 1881, Oberlin OH. 50. ii. CHARLES STONE, b. 12 Oct 1837, Pittsfield OH; d. 15 May 1911, Russia OH. iii. ELIZA STONE, b. Abt. 1840, OH; d. Aft. 1850.
iv. BETSEY STONE, b. Abt. 1843, OH; d. Aft. 1850.
v. REUBEN STONE, b. Abt. 1848, OH; d. Aft. 1850. 51. vi. ABBIE STONE, b. 28 Jul 1854, Pittsfield OH; d. 07 Mar 1932, Cleveland OH. 17. REUBEN6 HAYNES (MARTHA5 STONE, SAMUEL4, JOSEPH3, SIMON2, SIMON1) was born 03 Mar 1813 in Gardner MA, and died 02 Feb 1892 in Leominster MA/Stratham NH. He married (1) CHARLOTTE C GATES 21 Sep 1838 in int Gardner MA, daughter of DANIEL GATES and PHEBE MOSMAN. She was born 11 Aug 1818 in Gardner MA, and died 28 Sep 1863 in Leominster MA. He married (2) HARRIET N SMITH 01 Jan 1866 in MA, daughter of THEOPHILUS SMITH and NANCY CHASE. She was born Abt. 1829 in Stratham NH, and died Aft. 1880. 52. i. REUBEN WESLEY7 HAYNES, b. 14 Mar 1840, Ashburnham MA; d. 13 Aug 1899, Leominster MA. 53. ii. EVELINE LOUISE HAYNES, b. Abt. 1846, Ashburnham MA; d. 02 Feb 1892, Lancaster MA. iii. ETTA MARTHA7 HAYNES, b. Abt. 1868, MA; d. Aft. 1880. 18. MARY6 HAYNES (MARTHA5 STONE, SAMUEL4, JOSEPH3, SIMON2, SIMON1) was born 23 Feb 1815 in Gardner MA, and died 23 Oct 1896 in Leominster MA. She married DARWIN POWERS 11 Apr 1840 in Leominster MA. He was born 26 Nov 1808 in Sterling MA, and died 26 May 1897 in Leominster MA. 54. i. MARTHA7 POWERS, b. 10 Jul 1843, Leominster MA; d. 05 Jan 1887, Leominster MA. ii. MARY ANN POWERS, b. 06 Aug 1844, Leominster MA; d. 05 Oct 1847, Leominster MA. iii. MELISSA A POWERS, b. 18 Nov 1846, Leominster MA; d. Aft. 1920; m. CHARLES FRANK BOYDEN, 07 Dec 1865, Leominster MA; b. Abt. 1842, Leominster MA; d. 11 Aug 1909, Leominster MA. 55. iv. EZRA WILLIS POWERS, b. 31 Mar 1850, Leominster MA; d. Aft. 1920. 56. v. EDWIN UPTON POWERS, b. 06 Oct 1853, Leominster MA; d. Bet. 1900 - 1920.
vi. EVANDER FREMONT POWERS, b. 06 Sep 1856, Leominster MA; d. Aft. 1930. 57. vii. ELMER ELLSWORTH POWERS, b. 14 May 1861, Leominster MA; d. Bet. 1930 - 1940. 19. JOHN WESLEY6 COOLIDGE (MARTHA5 STONE, SAMUEL4, JOSEPH3, SIMON2, SIMON1) was born 22 Nov 1822 in Leominster MA, and died 14 Oct 1889 in Hancock NH. He married NANCY MERRIAM 27 Nov 1850 in Princeton/Leominster MA, daughter of CLARK MERRIAM and LORINDA ?. She was born 22 Jun 1831 in Leominster MA, and died Aft. 1900.
i. CHARLES WESLEY7 COOLIDGE, b. 14 Sep 1852, Leominster MA; d. Aft. 1930; m. KATE L BROWN, 07 Feb 1877, NH [& 1/28/1900 NH]; b. Abt. 1858, Independance OH; d. Aft. 1920. 58. ii. MARY E COOLIDGE, b. 24 Jul 1854, Wilbraham MA; d. Aft. 1910. 59. iii. EMMA A COOLIDGE, b. Aug 1858, Sturbridge MA; d. Aft. 1930. 60. iv. WILLIAM FLETCHER COOLIDGE, b. 29 Aug 1859, North Brookfield MA; d. 08 Sep 1935, Jaffrey NH. 61. v. JOHN WESLEY COOLIDGE, b. 16 Jan 1864, Leominster MA; d. Aft. 1940. 62. vi. HENRY ALBERT COOLIDGE, b. 07 May 1867, Leominster MA; d. Aft. 1940. 20. AI6 STONE (BENJAMIN5, SAMUEL4, JOSEPH3, SIMON2, SIMON1) was born 25 Aug 1817 in Gardner MA, and died 02 Oct 1877 in Winchendon MA. He married (1) HARRIET A J HADLEY 23 Nov 1844 in Winchendon MA, daughter of GAMALIEL HADLEY and MARTHA KNIGHT. She was born 05 Sep 1827 in Ashburnham MA, and died 13 Jul 1862 in Gardner MA. He married (2) SUSAN ANN JAQUITH 16 Nov 1863 in MA, daughter of JOSEPH JAQUITH and HANNAH GLEASON. She was born 30 Dec 1830 in Jaffrey NH, and died 03 Mar 1918 in Gardner MA. i. AI BENJAMIN7 STONE, b. 27 Aug 1845, Worcester County MA; d. 29 May 1863, New Orleans LA. 63. ii. JOHN CHARLES STONE, b. 12 Mar 1847, Gardner MA; d. Aft. 1910. 64. iii. REUBEN SYLVESTER STONE, b. 10 Apr 1849, Ashburnham MA; d. 03 Jan 1936.
iv. LEONARD FAYETTE STONE, b. 08 Jun 1851, Ashby MA; d. 10 Sep 1888, Gardner MA; m. MINNIE PINEO, 12 Mar 1879, Winchendon MA. v. SON STONE, b. 27 Apr 1853, Gardner MA; d. 28 Apr 1853, Gardner MA. 65. vi. LUCY ELLA STONE, b. 22 Jun 1855, Gardner MA; d. 02 Sep 1922, Gardner MA. vii. SUSAN ETTA STONE, b. 20 Apr 1859, Gardner MA; d. Aft. 1870.
viii. GEORGE SANSONE STONE KNOWLTON, b. 29 Aug 1861, Gardner MA - adopted by Leander Knowlton; d. 04 Sep 1881, Gardner MA. ix. WILLIS H7 STONE, b. 28 Dec 1865, Gardner MA; d. 21 Dec 1890, Gardner MA; m. AMY HILLMAN, 01 Nov 1889, Gardner MA; b. Abt. 1864; d. Aft. 1889. 66. x. ARTHUR LEON STONE, b. 23 Jun 1870, Gardner MA; d. 06 May 1943, Richmond Hill NY. 21. ALBERT6 STONE (BENJAMIN5, SAMUEL4, JOSEPH3, SIMON2, SIMON1) was born 30 Jun 1822 in Gardner MA, and died 23 Jul 1854 in Gardner MA. He married LOUISA E BAKER 20 Mar 1845 in Gardner MA, daughter of MARTIN BAKER and LYDIA MARTIN. She was born 21 May 1819 in Hubbardston MA, and died 22 Mar 1887 in Westminster MA. i. CALVIN CARTER7 STONE, b. 03 Jan 1849, Gardner MA; d. 06 Nov 1849, Gardner MA. ii. LUCY ELLA LOVINA STONE, b. 04 Sep 1850, Gardner MA; d. 27 Oct 1851, Gardner MA. 22. LEONARD6 STONE (BENJAMIN5, SAMUEL4, JOSEPH3, SIMON2, SIMON1) was born 03 Mar 1825 in Gardner MA, and died Aft. 1885. He married JANE ?. She was born Abt. 1835 in Ireland, and died Aft. 1880.
i. LUCY E7 STONE, b. Abt. 1861, CA; d. Aft. 1880.
ii. MARY J STONE, b. Abt. 1863, CA; d. Aft. 1880.
iii. WILLIAM STONE, b. Abt. 1867, CA; d. Aft. 1880.
iv. LIZZIE STONE, b. Abt. 1869, CA; d. Aft. 1880.
v. SARAH STONE, b. Abt. 1871, CA; d. Aft. 1880.
vi. SUSIE STONE, b. Abt. 1874, CA; d. Aft. 1880. 23. SAMPSON6 STONE (BENJAMIN5, SAMUEL4, JOSEPH3, SIMON2, SIMON1) was born 18 May 1827 in Gardner MA, and died 31 Mar 1871 in Chelsea VT. He married MARY E HOUGHTON, daughter of ELI HOUGHTON and MARY KILBURN. She was born 21 Apr 1841 in Sterling MA, and died 04 Jul 1922 in Buffalo NY. 67. i. MARY L7 STONE, b. Abt. 1859, MA; d. 01 Feb 1882, Worcester MA. 68. ii. CARRIE ELLA STONE, b. 05 Feb 1865, Gardner MA; d. 03 Jan 1942, Ithaca NY. iii. WILLIAM HENRY S STONE, b. 24 Aug 1870, Chelsea MA; d. 29 May 1948, Denver CO; m. (1) LAURA GERTRUDE ALLEN, 07 Jul 1897, Lowell MA; b. 17 Nov 1864, KS; d. 07 Aug 1917, Denver CO; m. (2) NELLIE MCKENNA, 11 Dec 1900, Manhatten NY. 24. LUCY6 STONE (BENJAMIN5, SAMUEL4, JOSEPH3, SIMON2, SIMON1) was born 28 Jan 1831 in Gardner MA, and died 25 Jun 1887 in Gardner MA. She married CHARLES LEONARD LOVEWELL 01 May 1857 in Gardner /Templeton MA, son of LEONARD LOVEWELL and LOUISA COMEE. He was born 02 May 1834 in Gardner MA, and died 13 Nov 1874 in Gardner MA. 69. i. JUDSON S7 LOVEWELL, b. 15 Nov 1858, Gardner MA; d. 1919. 70. ii. ELMER LINCOLN LOVEWELL, b. 06 Jun 1861, Gardner MA; d. 27 Apr 1928, Gardner MA. 71. iii. CHARLES EDWARD LOVEWELL, b. 03 Oct 1863, Gardner MA; d. Aft. 1920. 25. BRADLEY6 STONE (OLIVER5, SAMUEL4, JOSEPH3, SIMON2, SIMON1) was born 06 Aug 1824 in Sullivan NH, and died 24 Jun 1886 in Gilsum NH. He married (1) ASENATH JANE COLBURN 04 Jun 1851 in Brookline NH. She was born 21 Mar 1821 in Brookline/Hollis NH, and died 10 Oct 1861 in Milford NH. He married (2) HARRIET E J SEMPLE 27 Jun 1863 in Mason NH. She was born Abt. 1825 in East Cambridge MA, and died 20 Dec 1900 in Laconia NH. i. EDWARD D7 STONE, b. Abt. 1854, NH; d. Aft. 1870. 72. ii. ADA LILLIAN7 STONE, b. Feb 1865, Milford NH; d. 22 Jan 1933, Steubenville OH. iii. MYRA J STONE, b. Abt. 1867, NH; d. Aft. 1880. 26. MARY S6 STONE (OLIVER5, SAMUEL4, JOSEPH3, SIMON2, SIMON1) was born 29 Apr 1828 in Sullivan NH, and died 18 Nov 1884 in Chicopee MA. She married JOTHAM DEAN WOOLSON 06 Jul 1848 in Nashua NH. He was born 19 Jan 1827 in Milford NH, and died 20 Nov 1899 in Chicopee MA. i. MARTHA JANE7 WOOLSON, b. Abt. 1849, Milford NH; d. 19 Oct 1888, Lunenburg MA; m. WILLIAM HOWARD, 25 Sep 1882, Chicopee MA; b. Abt. 1847, Lunenburg MA. ii. GEORGIANNA WOOLSON, b. 24 Jul 1851, Cabotville MA; d. Aft. 1882; m. FRANCIS W PERRY, 27 Sep 1882, Chicopee/Palmer MA; b. Abt. 1859, Bridgeport CT; d. Aft. 1900. 27. MARY S6 PATCH (MARY5 STONE, SAMUEL4, JOSEPH3, SIMON2, SIMON1) was born 03 Feb 1814 in Ashby MA, and died 25 Nov 1877 in Ashby MA. She married SAMUEL HAYWARD 21 Apr 1835 in Ashby MA, son of PAUL HAYWARD and LUCY WHITCOMB. He was born 01 Dec 1811 in Boxborough MA, and died 13 Oct 1899 in Ashby MA. i. CECIL F7 HAYWARD, b. 18 May 1837, Ashby MA; d. 02 Mar 1914, Ashby MA; m. ADDIE A KING, 14 Feb 1866, Ashby MA; b. Abt. 1842, Newton MA; d. 13 Sep 1892, Ashby MA. 73. ii. JONAS P HAYWARD, b. 18 Sep 1842, Ashby MA; d. 29 Nov 1887, Ashby MA. iii. SARAH F HAYWARD, b. Abt. 1843, MA; d. Aft. 1855. 74. iv. LYRA MARIA HAYWARD, b. 11 Mar 1852, Ashby MA; d. 08 Nov 1915, Lunenburg MA. 28. ABIGAIL6 STONE (ABRAHAM5, SAMUEL4, JOSEPH3, SIMON2, SIMON1) was born 26 Jul 1822 in Gardner MA, and died Aft. 1855. She married STEPHEN PUFFER WHITNEY 22 Dec 1841 in Hubbardston MA [11/27/1841 Westminster MA], son of JOSEPH WHITNEY and LEVINAH DUNN. He was born 10 Jan 1821 in Westminster MA, and died 11 Dec 1851 in Templeton MA. 75. i. BELINDA7 WHITNEY, b. 26 Oct 1842, Wilbraham MA; d. Aft. 1900. 76. ii. ABBY L WHITNEY, b. 12 Oct 1844, Westminster MA; d. 24 Dec 1896, Winchendon MA. iii. EDWARD C WHITNEY, b. Feb 1850, Templeton MA; d. 12 Sep 1851, Templeton MA. 29. LYDIA6 STONE (ABRAHAM5, SAMUEL4, JOSEPH3, SIMON2, SIMON1) was born 24 Oct 1824 in Gardner MA, and died 14 Oct 1910 in Templeton MA. She married ALBERT JOSEPH CONANT 04 May 1844 in Gardner MA (? ), son of NATHAN CONANT and PARMELIA MILLER. He was born Abt. 1820 in Alstead NH, and died 18 Oct 1869 in Templeton MA. i. NELSON7 CONANT, b. Abt. 1845, Gardner MA; d. 30 Jun 1848, Gardner MA. 77. ii. ANN J CONANT, b. May 1848, Gardner MA; d. Aft. 1920.
iii. JULIAN CONANT, b. Abt. 1852, Townsend MA; d. 03 Apr 1852, Townsend MA. iv. MARY FRANCES CONANT, b. 15 Jan 1854, Templeton MA; d. Aft. 1880.
v. ELSIE VANNETTA CONANT, b. 21 Aug 1856, Templeton MA; d. Aft. 1910; m. AMOS MORSE, 05 Sep 1909, Baldwinville MA; b. Abt. 1833, Hubbardston MA; d. 23 Jul 1914, East Templeton MA. 78. vi. CARRIE BELLE CONANT, b. 22 Jun 1859, Templeton MA; d. Aft. 1920.
vii. ALBERT ELLSWORTH CONANT, b. 28 Feb 1868, Templeton MA; d. 02 Dec 1873, Templeton MA. 30. MIRIAM6 WALKER (DIADAMIA5 STONE, SAMUEL4, JOSEPH3, SIMON2, SIMON1) was born 21 Aug 1824 in Holden MA, and died 12 Feb 1861 in West Boylston MA. She married WINDSOR NEWTON WHITE 28 Aug 1844 in West Boylston MA. He was born 08 Mar 1823 in West Boylston MA, and died Aft. 1870.
i. JOSEPH NELSON7 WHITE, b. 01 Aug 1845, West Boylston MA; d. 19 Jan 1847, West Boylston MA. ii. MATILDA MANDANA WHITE, b. 24 Apr 1847, West Boylston MA; d. 12 Aug 1848, West Boylston MA. 79. iii. WILLIAM WALKER WHITE, b. Apr 1849, Winchendon MA; d. Aft. 1920.
iv. THOMAS WHITE, b. 21 Apr 1850, Winchendon MA; d. Aft. 1910. 80. v. EMMA A WHITE, b. Abt. 1852, Winchendon MA; d. Aft. 1880. 81. vi. JOSEPH E WHITE, b. May 1854, MA; d. Aft. 1940. 82. vii. JOHN A WHITE, b. 09 Aug 1859, West Boylston MA; d. Aft. 1940. 31. EMILY6 WALKER (DIADAMIA5 STONE, SAMUEL4, JOSEPH3, SIMON2, SIMON1) was born 14 Sep 1826 in Holden MA, and died Aft. 1920. She married WILLIAM W PARKER 31 Aug 1847 in Holden MA. He was born Abt. 1825 in MA, and died 22 Sep 1894 in West Boylston MA. 83. i. WILLIAM E7 PARKER, b. Abt. 1861, NH/ME; d. Bet. 1920 - 1930. 32. ALONA ALLEN6 WALKER (DIADAMIA5 STONE, SAMUEL4, JOSEPH3, SIMON2, SIMON1) was born 04 Feb 1830 in Holden MA, and died Aft. 1920. She married ALBERT HINDS 25 Dec 1863 in Sterling MA. He was born Abt. 1830 in Harvard MA, and died 28 Feb 1874 in West Boylston MA. i. ALBERT W7 HINDS, b. 30 Nov 1864, West Boylston MA; d. Aft. 1940; m. MARGARET M ? ; b. Abt. 1900, MA; d. Aft. 1940.
ii. DAUGHTER HINDS, b. 22 Nov 1868, West Boylston MA; d. Bef. 1870. 33. LUCY6 WALKER (DIADAMIA5 STONE, SAMUEL4, JOSEPH3, SIMON2, SIMON1) was born 11 Aug 1832 in Holden MA, and died Aft. 1920. She married FRANCIS MERRIAM 19 Dec 1852 in MA. He was born 22 Apr 1829 in Sterling MA/Nelson NH, and died 03 Mar 1907 in Boylston MA. 84. i. NELLIE G7 MERRIAM, b. Abt. 1854, Sterling MA; d. Aft. 1930.
ii. HATTIE L MERRIAM, b. Abt. 1856, MA; d. 15 May 1872, West Boylston MA. iii. EDWARD FRANCIS MERRIAM, b. 11 Jan 1858, Sterling MA; d. Aft. 1930. 34. ALVA STONE6 WALKER (DIADAMIA5 STONE, SAMUEL4, JOSEPH3, SIMON2, SIMON1) was born 21 Apr 1836 in Holden MA, and died Feb 1911 in NY. He married (1) EMILY R MORSE 17 Aug 1862, daughter of ROSINA H ?. She was born Abt. 1839 in CT, and died 31 Mar 1876 in PhiladelphiaPA. He married (2) ELIZABETH H THOMSON 09 Jul 1879 in Manhatten NY. She was born Mar 1844 in NY, and died Aft. 1900.
i. GRACE E7 WALKER, b. Abt. 1865, IN; d. Aft. 1930. 85. ii. EDITH MAY WALKER, b. May 1867, IN; d. Aft. 1910. 86. iii. FREDERICK H WALKER, b. Jul 1870, IN; d. Aft. 1920. 35. MARTHA WILDER6 WALKER (DIADAMIA5 STONE, SAMUEL4, JOSEPH3, SIMON2, SIMON1) was born 19 Jan 1838 in Holden MA, and died 30 May 1863 in Holden MA. She married DANIEL GRANT HOLBROOK 31 Dec 1857 in Holden MA. He was born 30 Nov 1835 in Holden MA, and died 22 Mar 1912 in Holden MA. 87. i. ERVIN D7 HOLBROOK, b. Dec 1859, MA; d. Aft. 1930.
ii. ALVA WALKER HOLBROOK, b. 23 May 1861, Holden MA; d. 05 Feb 1907, Worcester MA; m. EVA MEDORA COLEMAN, 21 Nov 1883, Gardner MA - later divorced? ; b. 25 Oct 1865, Gardner MA; d. 1945. 88. iii. WILLIAM LEVI HOLBROOK, b. 17 Aug 1862, MA; d. Aft. 1940. 36. CHRISTOPHER COLUMBUS6 COMEE (MERRIAM5 STONE, SAMUEL4, JOSEPH3, SIMON2, SIMON1) was born 28 Jan 1827 in Gardner MA, and died Aft. 1900. He married MARVA GRISWALD Abt. 1848. She was born Jun 1830 in NY, and died Aft. 1900.
i. EMMA J7 COMEE, b. Abt. 1849; d. Aft. 1850. 89. ii. SYLVESTER GRISWOLD COMEE, b. Apr 1853, NY; d. 18 May 1926, Minneapolis MN. iii. ADDIE L COMEE, b. Abt. 1855, NY; d. Aft. 1870.
iv. IRENE M COMEE, b. Dec 1857, NY; d. Aft. 1900.
v. FLORENCE B COMEE, b. Aug 1864, NY; d. Aft. 1900.
vi. SARAH BERTHA COMEE, b. Jul 1868, MN; d. Aft. 1900. 90. vii. JOSEPH FRED COMEE, b. 19 Oct 1869, Wasecea MN; d. 23 Jul 1943, Evanston IL. 37. SAMUEL S6 COMEE (MERRIAM5 STONE, SAMUEL4, JOSEPH3, SIMON2, SIMON1) was born 07 Jun 1830 in MA, and died 17 Nov 1907 in Minneapolis MN. He married SARAH WHITE SAWIN 13 May 1855 in Gardner MA, daughter of JOSEPH SAWIN and MARCIA SCRIBNER. She was born 03 Jul 1836 in Gardner MA, and died Aft. 1920. 91. i. MYRA A7 COMEE, b. Sep 1860, NY; d. Aft. 1930. 92. ii. MARTHA J COMEE, b. Oct 1862, NY; d. Bet. 1920 - 1930. 38. MARTHA S6 COMEE (MERRIAM5 STONE, SAMUEL4, JOSEPH3, SIMON2, SIMON1) was born Abt. 1835 in MA, and died Aft. 1895. She married OTIS D SAWIN in by 1865, son of JOSEPH SAWIN and MARCIA SCRIBNER. He was born 17 Apr 1834 in Gardner MA, and died 14 Nov 1917 in Miami FL. i. WINNIE M7 SAWIN, b. Abt. 1865, NY; d. Aft. 1880. 39. BAMAN NELSON7 STONE (NELSON6, EUNICE5, SAMUEL4, JOSEPH3, SIMON2, SIMON1) was born 28 Jul 1841 in Hopkinton MA, and died Aft. 1910. He married EMILY FARRINGTON 03 Jun 1880 in Boston MA. She was born Oct 1844 in ME, and died Aft. 1910. 93. i. CLARENCE NELSON8 STONE, b. 24 Jul 1883, ME; d. Aft. 1940. 40. MARTHA JANE7 STONE (NELSON6, EUNICE5, SAMUEL4, JOSEPH3, SIMON2, SIMON1) was born 18 Aug 1844 in Wayland MA, and died 12 Feb 1914 in Wareham MA. She married (1) ? ?. She married (2) DAVID L PETTEGREW 27 Mar 1863 in Sterling MA - later divorced, son of STEPHEN PETTEGREW and MARY HILL. He was born Mar 1828 in Lyme NH, and died 19 Jan 1914 in Worcester MA. 94. i. PHOEBE H8 STONE, b. May 1882, MA; d. Aft. 1940. 95. ii. EMMA G8 PETTEGREW, b. Sep 1866, Claremont NH; d. Bet. 1920 - 1930. 41. CATHERINE AUGUSTA7 STONE (NELSON6, EUNICE5, SAMUEL4, JOSEPH3, SIMON2, SIMON1) was born 15 Dec 1846 in Wayland MA, and died 23 Jan 1906 in Athol MA. She married ANDREW SANDERSON 26 Apr 1864 in Sterling MA, son of JESSE SANDERSON and MARILLA TURNER. He was born 16 Apr 1842 in Lunenburg MA, and died Aft. 1920.
i. ANDREW EVERETT8 SANDERSON, b. 11 Feb 1866, Lunenburg MA; d. 14 Feb 1869, Sudbury MA. 96. ii. JACOB WESLEY W SANDERSON, b. 17 Mar 1868, Phillipston MA; d. 07 Sep 1963, Washington County OR. iii. LUCY E SANDERSON, b. 21 Sep 1871, Palmer MA; d. Aft. 1880.
iv. ALICE SANDERSON, b. Abt. 1874, Athol MA; d. 06 Oct 1874, Athol MA. v. ARTHUR EARL SANDERSON, b. Jan 1880, Gleasondale MA; d. Aft. 1940; m. GERTRUDE L LINCOLN HALL, 21 Nov 1906, North Windham CT; b. Mar 1877, South Coventry CT; d. Aft. 1940. 97. vi. BENJAMIN F BUTLER SANDERSON, b. 23 Apr 1883, Westford MA; d. Aft. 1940.
vii. ETHEL J SANDERSON, b. 26 Feb 1886, Athol MA; d. Aft. 1900.
viii. LUCY E SANDERSON, b. 26 Feb 1886, Athol MA. 42. ALMON HUMPHREY7 STONE (NELSON6, EUNICE5, SAMUEL4, JOSEPH3, SIMON2, SIMON1) was born Feb 1856 in MA, and died Aft. 1940. He married SOPHIA BESSE HUMPHREY 26 May 1887 in Wareham/Phillipston MA, daughter of GALEN HUMPHREY and NANCY BESSE. She was born 23 Mar 1853 in Wareham MA, and died Aft. 1940. 98. i. NELSON8 STONE, b. 09 Sep 1891, Wareham MA; d. 03 May 1982, Barnstable MA. 43. HENRY J7 STONE (ANDREW JACKSON6, EUNICE5, SAMUEL4, JOSEPH3, SIMON2, SIMON1) was born 14 May 1843 in Wayland MA, and died 09 Sep 1907 in Cambridge MA. He married LAURA A FLEETWOOD 15 May 1864 in Lynn/Malden MA. She was born Abt. 1844 in Lowell MA, and died 08 Oct 1898 in Malden MA. i. LULU MABLE8 STONE, b. 13 Apr 1865, Malden MA; d. Aft. 1910.
ii. ELIZABETH FLORENCE STONE, b. 18 Jul 1870, Chelsea MA; d. Aft. 1900. 99. iii. LEILA GRACE STONE, b. 04 Oct 1873, Chelsea MA; d. Aft. 1940. 44. (HATTIE) ELLA MARIA7 STONE (ANDREW JACKSON6, EUNICE5, SAMUEL4, JOSEPH3, SIMON2, SIMON1) was born 24 Jun 1855 in Oxford MA, and died Aft. 1910. She married FREDERICK A SMART 23 Dec 1874 in Chelsea MA. He was born May 1849 in NH, and died Bet. 1900 - 1910.
i. LOIS AMERETTE8 SMART, b. 01 Dec 1875, Chelsea MA; d. Aft. 1920. 100. ii. ANNA EVELYN SMART, b. 16 May 1878, Medford MA; d. Aft. 1940.
iii. FREDERICK PERCIVAL SMART, b. 10 Nov 1880, Lexington MA; d. 05 May 1904, Framingham MA. iv. WALTER HARLAN SMART, b. 25 Mar 1883, Revere MA; d. Aft. 1930. 101. v. HERBERT LEIGHTON SMART, b. 30 May 1889, Chelsea MA; d. Aft. 1942.
vi. MARY A SMART, b. Abt. 1905, MA - granddaughter, daughter of Lois or Anna? ; d. Aft. 1940. 45. ELMER JOSEPH7 STONE (JOSEPH6, SAMUEL5, SAMUEL4, JOSEPH3, SIMON2, SIMON1) was born 08 Jan 1844 in OH, and died 05 Apr 1914 in McLeod County MN. He married SUSANNA C MILLS 10 Sep 1867 in Lorain OH. She was born 03 Oct 1847 in OH, and died 04 Sep 1912 in McLeod County MN. 102. i. JOSEPH EMERSON8 STONE, b. Jul 1868, Litchfield MN; d. 07 Aug 1941, Meeker County MN. ii. ESTHER G STONE, b. 01 Jul 1870, MN; d. 23 Feb 1935, Minneapolis MN. iii. HARRIET B STONE, b. Jul 1875, MN; d. Aft. 1900. 46. MARY ANN7 STONE (JOSEPH6, SAMUEL5, SAMUEL4, JOSEPH3, SIMON2, SIMON1) was born 25 Sep 1847 in Pittsfield OH, and died 22 Feb 1936 in Hutchinson MN. She married FRANKLIN CARLOS AVERY 16 Oct 1867 in Lorain OH. He was born Oct 1846 in OH, and died Bet. 1910 - 1920. 103. i. CARLOS8 AVERY, b. 25 Jan 1868, Minooka IL; d. 05 Oct 1930, Long island City NY. ii. ESTHER AVERY, b. 01 Dec 1869, Pittsfield OH; d. Aft. 1870.
iii. BLANCH E AVERY, b. 17 Aug 1871, Pittsfield OH; d. Aft. 1900.
iv. ARCHER S AVERY, b. 22 Mar 1875, MN; d. 13 Jul 1936, Hutchinson MN. v. PERCY ELMER AVERY, b. 23 Sep 1877, Pittsfield OH; d. 30 Sep 1945. 104. vi. AMOS FRANKLIN AVERY, b. 18 Dec 1883, MN; d. 28 Apr 1914, Stewart MN. 47. SHELDON C7 STONE (JOSEPH6, SAMUEL5, SAMUEL4, JOSEPH3, SIMON2, SIMON1) was born Nov 1849 in OH, and died 01 Apr 1939 in McLeod MN. He married EVA A LADOW Abt. 1871. She was born Oct 1852 in OH, and died 05 Apr 1936 in Acoma MN. 105. i. ARTHUR MARK8 STONE, b. 1872, MN; d. 30 Apr 1922, Acoma MN. ii. RUTH G STONE, b. Aug 1884, MN; d. Aft. 1900. 48. JULIA ESTHER7 STONE (JOSEPH6, SAMUEL5, SAMUEL4, JOSEPH3, SIMON2, SIMON1) was born 23 Oct 1854 in Pittsfield OH, and died 10 Mar 1931 in McLeod County MN. She married (1) FRANKLIN W HARSEN. He was born 10 Dec 1855 in Madison WI, and died Oct 1883 in MN. She married (2) RICHARD MAX IKEN Abt. 1893. He was born 04 Sep 1865 in WI, and died 09 Dec 1945 in Dawson/Lac Qui MN. i. JESSE A8 HARSEN, b. Apr 1882, MN; d. Aft. 1900. 106. ii. FRANKLIN S HARSEN, b. 29 Nov 1883, MN; d. 11 Feb 1968, Los Angeles CA. 107. iii. MAX RICHARD8 IKEN, b. 14 May 1893, Cedar Mills MN; d. 19 Apr 1970, Beltrami MN. 49. FRANKLIN7 STONE (REUBEN6, JOSIAH5, SAMUEL4, JOSEPH3, SIMON2, SIMON1) was born Abt. 1835 in Pittsfield OH, and died 05 Jun 1881 in Oberlin OH. He married HULDAH J ?. She was born 17 Sep 1840 in CT, and died 20 Jun 1893 in Oberlin OH. 108. i. JUDSON NORTON8 STONE, b. 18 Apr 1862, Pittsfield OH; d. 15 Apr 1950, OH. 109. ii. EMERSON ERASTUS STONE, b. Nov 1865, OH; d. 03 Nov 1921, Modesto CA. 110. iii. MARK A STONE, b. 22 Jan 1868, Pittsfield OH; d. 1920.
iv. FRANKLIN STONE, b. 22 Jan 1868, Pittsfield OH; d. Bef. 1870.
v. FRANK R STONE, b. Abt. 1874, OH; d. Aft. 1880. 50. CHARLES7 STONE (REUBEN6, JOSIAH5, SAMUEL4, JOSEPH3, SIMON2, SIMON1) was born 12 Oct 1837 in Pittsfield OH, and died 15 May 1911 in Russia OH. He married LUCY IVES Abt. 1860. She was born 26 Aug 1839 in Pittsfield OH, and died 11 Dec 1934 in Canton OH. i. L NELLIE8 STONE, b. Jan 1879, OH - not in 1880 census - adopted? ; d. Aft. 1900. 51. ABBIE7 STONE (REUBEN6, JOSIAH5, SAMUEL4, JOSEPH3, SIMON2, SIMON1) was born 28 Jul 1854 in Pittsfield OH, and died 07 Mar 1932 in Cleveland OH. She married ROBERT JAMES CUMMER Abt. 1881. He was born Dec 1853 in Watertown Canada, and died 22 Oct 1905 in Cleveland OH. 111. i. CLYDE LOTTRIDGE8 CUMMER, b. 23 Feb 1882, Cadillac MI; d. 07 Jun 1958, Cleveland OH. ii. BESSIE R CUMMER, b. 27 Jul 1886, Cadillac MI; d. Aft. 1910. 52. REUBEN WESLEY7 HAYNES (REUBEN6, MARTHA5 STONE, SAMUEL4, JOSEPH3, SIMON2, SIMON1) was born 14 Mar 1840 in Ashburnham MA, and died 13 Aug 1899 in Leominster MA. He married ELLEN N FRENCH 20 Jul 1863 in Leominster MA, daughter of JAMES FRENCH and CAROLLINE ?. She was born Abt. 1841 in Lowell MA, and died 14 Nov 1887 in Leominster MA. 112. i. WILLIS REUBEN8 HAYNES, b. 13 May 1865, Leominster MA; d. Bet. 1920 - 1930.
ii. EVELINE LOUISA HAYNES, b. 06 Dec 1869, Leominster MA; d. Aft. 1893; m. (1) WILLIAM F WAITT, 30 Oct 1885, Leominster MA - later divorced; b. Abt. 1864, MA; d. Aft. 1900; m. (2) RUSSELL B HIBBS, 21 Jan 1891, Boston MA; b. Abt. 1867, West Newbury MA; d. 03 Feb 1905, Lynn MA; m. (3) EDWARD HERBERT KIRKPATRICK, 08 Mar 1893, Everett MA; b. 10 Sep 1869, Somerville MA; d. Aft. 1894.
iii. ERNEST F HAYNES, b. 10 Jun 1873, Leominster MA; d. 27 Jun 1873, Leominster MA. iv. EDWARD F HAYNES, b. 10 Jun 1873, Leominster MA; d. 15 Jul 1873.
v. DAUGHTER HAYNES, b. 11 Apr 1876, Leominster MA; d. Bef. 1880. 53. EVELINE LOUISE7 HAYNES (REUBEN6, MARTHA5 STONE, SAMUEL4, JOSEPH3, SIMON2, SIMON1) was born Abt. 1846 in Ashburnham MA, and died 02 Feb 1892 in Lancaster MA. She married WALTER JOHNSON MORSE 02 Aug 1864 in Leominster MA. He was born Sep 1839 in Lunenburg MA, and died Aft. 1920.
i. LOTTIE LOUISA8 MORSE, b. Abt. 1865, MA; d. 15 Jul 1890, Sterling MA. ii. CHARLES NEUTON MORSE, b. 16 Jun 1867, Sudbury MA; d. Aft. 1910; m. MARIETTA B LEWIS, 04 Jun 1896, NH; b. Jan 1871, MA; d. Aft. 1910.
iii. GEORGE FRANCIS MORSE, b. 28 Jun 1870, Princeton MA; d. Aft. 1930; m. EMMA A CHARLOW, 23 Aug 1904, Maynard MA; b. Abt. 1869, ME; d. Aft. 1930.
iv. ELEANOR EVELINE MORSE, b. 04 Mar 1873, Sterling MA; d. Aft. 1880.
v. MARY ABBY MORSE, b. 29 Jul 1874, Sterling MA; d. 30 Mar 1892, Lancaster MA. vi. EDITH BERTHA MORSE, b. 06 Apr 1877, Sterling MA; d. 13 Oct 1894, Leominster MA. vii. CLARENCE CUTTER MORSE, b. 22 Jun 1880, Sterling MA; d. Aft. 1930; m. IDA MAY HILL, 20 Nov 1902, Fitchburg MA; b. Abt. 1884, NH; d. Aft. 1930.
viii. HARRY BURTON MORSE, b. 14 Feb 1884, Sterling MA; d. Aft. 1906; m. CATHRYN AGNES MEADER, 03 Sep 1906, Leominster MA. 54. MARTHA7 POWERS (MARY6 HAYNES, MARTHA5 STONE, SAMUEL4, JOSEPH3, SIMON2, SIMON1) was born 10 Jul 1843 in Leominster MA, and died 05 Jan 1887 in Leominster MA. She married HENRY AUGUSTUS BOUTELLE 11 Jun 1867 in MA. He was born 04 Jan 1842 in MA, and died Aft. 1920.
i. MARY ELIZABETH8 BOUTELLE, b. 27 Sep 1869, Leominster MA; d. Aft. 1940.
ii. WILLIAM POWERS BOUTELLE, b. 10 Oct 1873, Leominster MA; d. 21 Aug 1897, Leominster MA. 113. iii. ELMER HENRY BOUTELLE, b. 09 Mar 1876, Leominster MA; d. Aft. 1940. 114. iv. ALBERT ARTHUR BOUTELLE, b. 14 Jul 1878, Leominster MA; d. Aft. 1942. 115. v. CLARENCE ALFRED BOUTELLE, b. 01 Aug 1881, Leominster MA; d. Aft. 1920.
vi. AMY MABEL BOUTELLE, b. 18 Mar 1884, Leominster MA; d. 22 Feb 1903, Leominster MA. 55. EZRA WILLIS7 POWERS (MARY6 HAYNES, MARTHA5 STONE, SAMUEL4, JOSEPH3, SIMON2, SIMON1) was born 31 Mar 1850 in Leominster MA, and died Aft. 1920. He married ANNA LEGATE 20 Dec 1883 in Clinton/Sterling MA. She was born May 1862 in NH, and died Bet. 1900 - 1910.
i. ELSIE WINIFRED8 POWERS, b. 19 May 1885, Leominster MA; d. Aft. 1930.
ii. BERNICE ADELE POWERS, b. 20 Sep 1886, Leominster MA; d. Aft. 1930. 116. iii. MINOT LEGATE POWERS, b. 06 Jun 1888, Leominster MA; d. Aft. 1940.
iv. EZRA STANLEY POWERS, b. 05 May 1889, Leominster MA; d. Aft. 1942; m. MARY R ? ; b. Abt. 1889, CT; d. Aft. 1920.
v. WILLIAM MORRIS RUSSELL POWERS, b. 27 May 1890, Leominster MA; d. 29 Apr 1983, Fitchburg MA. vi. MARY EILENE POWERS, b. 04 Oct 1892, Leominster MA; d. Aft. 1920. 117. vii. GURDON FREMONT POWERS, b. 12 Jan 1895, Leominster MA; d. Aft. 1940. 56. EDWIN UPTON7 POWERS (MARY6 HAYNES, MARTHA5 STONE, SAMUEL4, JOSEPH3, SIMON2, SIMON1) was born 06 Oct 1853 in Leominster MA, and died Bet. 1900 - 1920. He married MINNIE A HOWE 08 Mar 1881 in MA, daughter of ELBRIDGE HOWE and CLARA ?. She was born Dec 1862 in NH, and died Aft. 1920. 118. i. EMMA LOUISE8 POWERS, b. Dec 1881, Leominster MA; d. Aft. 1930. 119. ii. FREDERICK EMERSON POWERS, b. 30 Oct 1884, Leominster MA; d. Aft. 1930. 57. ELMER ELLSWORTH7 POWERS (MARY6 HAYNES, MARTHA5 STONE, SAMUEL4, JOSEPH3, SIMON2, SIMON1) was born 14 May 1861 in Leominster MA, and died Bet. 1930 - 1940. He married GRACE GREENWOOD 08 Nov 1888 in Leominster MA. She was born Jul 1871 in OH, and died Aft. 1940. 120. i. HAROLD ELMER8 POWERS, b. 13 May 1890, Leominster MA; d. Aft. 1940. 121. ii. ERNEST TYLER POWERS, b. 29 May 1894, Leominster MA; d. Aft. 1940. 58. MARY E7 COOLIDGE (JOHN WESLEY6, MARTHA5 STONE, SAMUEL4, JOSEPH3, SIMON2, SIMON1) was born 24 Jul 1854 in Wilbraham MA, and died Aft. 1910. She married GEORGE C DUNCAN 16 Feb 1876 in Hancock NH/Leominster MA. He was born 28 May 1854 in Hancock NH, and died 12 Jan 1899 in East Jaffrey NH. i. GEORGE HENRY8 DUNCAN, b. 22 Dec 1876, NH; d. Aft. 1917.
ii. FLORENCE EMMA DUNCAN, b. 23 Jun 1883, Jaffrey NH; d. Aft. 1900.
iii. WILLIAM CHRISTIE DUNCAN, b. 02 Oct 1888, East Jaffrey NH; d. Aft. 1930. 59. EMMA A7 COOLIDGE (JOHN WESLEY6, MARTHA5 STONE, SAMUEL4, JOSEPH3, SIMON2, SIMON1) was born Aug 1858 in Sturbridge MA, and died Aft. 1930. She married JAMES T WESTON 20 Jun 1891 in Hancock NH. He was born May 1860 in NH, and died Bet. 1920 - 1930.
i. NANCY MAE8 WESTON, b. Jun 1893, NH; d. Aft. 1930. 60. WILLIAM FLETCHER7 COOLIDGE (JOHN WESLEY6, MARTHA5 STONE, SAMUEL4, JOSEPH3, SIMON2, SIMON1) was born 29 Aug 1859 in North Brookfield MA, and died 08 Sep 1935 in Jaffrey NH. He married MABEL PRESCOTT 08 Nov 1888 in East Jaffrey NH. She was born 26 Aug 1866 in NH, and died 31 Aug 1924 in Jaffrey NH. 122. i. ALVIN WILLIAM8 COOLIDGE, b. 05 Aug 1889, West Boylston MA; d. Aft. 1940.
ii. WINIFRED MABEL COOLIDGE, b. 22 Apr 1891, West Boylston MA; d. May 1982, Cheshire NH; m. CLARON DAYTON GUMMERSON; b. 24 Oct 1889, Marlborough MA; d. Aft. 1942. 123. iii. DORIS SYLVIA COOLIDGE, b. May 1895, MA; d. 25 Dec 1947, Peterborough NH. 61. JOHN WESLEY7 COOLIDGE (JOHN WESLEY6, MARTHA5 STONE, SAMUEL4, JOSEPH3, SIMON2, SIMON1) was born 16 Jan 1864 in Leominster MA, and died Aft. 1940. He married FLORENCE C WARE 12 Nov 1898 in Hancock NH. She was born May 1877 in NH, and died Aft. 1940. 124. i. ELEANOR C8 COOLIDGE, b. Abt. 1903, NH; d. Aft. 1940. 125. ii. IRMA COOLIDGE, b. Abt. 1906, NH; d. Aft. 1940. 62. HENRY ALBERT7 COOLIDGE (JOHN WESLEY6, MARTHA5 STONE, SAMUEL4, JOSEPH3, SIMON2, SIMON1) was born 07 May 1867 in Leominster MA, and died Aft. 1940. He married (1) BLANCHE L DODGE 02 Sep 1895 in NH, daughter of EDWARD DODGE and LAURA ?. She was born 26 Apr 1878 in Stoddard NH, and died 15 Nov 1898 in Wilmot NH. He married (2) DORA M SARGENT 09 Oct 1900 in NH. She was born Abt. 1875 in NH, and died Aft. 1940.
i. PAULINE8 COOLIDGE, b. 26 Nov 1901, Francestown NH; d. 03 Nov 1903, Greenfield NH. ii. MARY LOUISE COOLIDGE, b. 08 Feb 1903, Francestown NH; d. Aft. 1920. 126. iii. GEORGE W COOLIDGE, b. Abt. 1906, NH; d. Aft. 1940. 63. JOHN CHARLES7 STONE (AI6, BENJAMIN5, SAMUEL4, JOSEPH3, SIMON2, SIMON1) was born 12 Mar 1847 in Gardner MA, and died Aft. 1910. He married ELLA HARRIET BEMIS 23 Apr 1870 in Winchendon MA, daughter of REUBEN BEMIS and HARRIET ?. She was born Aug 1848 in MA, and died Aft. 1910. 127. i. HARRY SYLVESTER8 STONE, b. 06 Sep 1874, Gardner MA; d. Aft. 1940. 128. ii. MILO CALVIN STONE, b. 22 Nov 1878, Gardner MA; d. Aft. 1930. 64. REUBEN SYLVESTER7 STONE (AI6, BENJAMIN5, SAMUEL4, JOSEPH3, SIMON2, SIMON1) was born 10 Apr 1849 in Ashburnham MA, and died 03 Jan 1936. He married MARY ABBIE RAYMOND 17 Apr 1872 in Gardner MA, daughter of ASA RAYMOND and SUSAN THURSTON. She was born 07 Oct 1849 in Gardner MA, and died 18 Nov 1928. 129. i. ALBERT HENRY8 STONE, b. 08 Oct 1882, Gardner MA; d. 02 Jun 1948. 65. LUCY ELLA7 STONE (AI6, BENJAMIN5, SAMUEL4, JOSEPH3, SIMON2, SIMON1) was born 22 Jun 1855 in Gardner MA, and died 02 Sep 1922 in Gardner MA. She married ARTHUR JOSEPH REED 07 Nov 1874 in Winchendon MA, son of JOSEPH REED and OLIVIA ALGER. He was born Abt. 1854 in Winchendon MA, and died Aft. 1920.
i. BERTHA LILLIAN8 REED, b. Abt. 1875, Gardner MA; d. 24 Nov 1950, Worcester MA; m. CHARLES EUGENE WEEKS, 26 Jan 1905, Upton MA; b. Apr 1880, MA; d. Aft. 1940.
ii. ELLERY ARTHUR REED, b. 16 Feb 1877, Winchendon MA; d. Aft. 1880. 66. ARTHUR LEON7 STONE (AI6, BENJAMIN5, SAMUEL4, JOSEPH3, SIMON2, SIMON1) was born 23 Jun 1870 in Gardner MA, and died 06 May 1943 in Richmond Hill NY. He married EMMA PHILLIPS COLEMAN 06 Jul 1898 in Gardner MA, daughter of MELVIN COLEMAN and ELLEN FOSKETT. She was born 01 Jul 1876 in Gardner MA, and died 16 Nov 1952 in Richmond Hill NY. i. NORMA EVELYN8 STONE, b. 25 Oct 1905, Gardner MA; d. Aft. 1930. 67. MARY L7 STONE (SAMPSON6, BENJAMIN5, SAMUEL4, JOSEPH3, SIMON2, SIMON1) was born Abt. 1859 in MA, and died 01 Feb 1882 in Worcester MA. She married JOSEPH MONEY. i. CHILD8 MONEY, b. 14 Jan 1882, Worcester MA. 68. CARRIE ELLA7 STONE (SAMPSON6, BENJAMIN5, SAMUEL4, JOSEPH3, SIMON2, SIMON1) was born 05 Feb 1865 in Gardner MA, and died 03 Jan 1942 in Ithaca NY. She married HARRY SCOTT KENERSON 1885 in Revere MA, son of WINFIELD KENERSON and JANE GILMAN. He was born 03 Jul 1864 in Boston MA, and died 09 Nov 1914 in Buffalo NY. i. CHARLES JOSEPH8 KENERSON, b. 16 Sep 1888, Somerville MA; d. 12 Jul 1963, Ithaca NY. ii. ALBERT S KENERSON, b. 21 Jul 1890, Cambridge MA; d. 16 Dec 1943, Fremont NE. iii. ROYAL STONE KENERSON, b. 08 Jun 1899, Leominster MA. 69. JUDSON S7 LOVEWELL (LUCY6 STONE, BENJAMIN5, SAMUEL4, JOSEPH3, SIMON2, SIMON1) was born 15 Nov 1858 in Gardner MA, and died 1919. He married ADA MELISSA ENSOR 07 Mar 1888 in Gardner MA, daughter of JAMES ENSOR and SOPHRONIA ANDREWS. She was born Jul 1865 in Nova Scotia, and died 1944. 130. i. AMY V8 LOVEWELL, b. Sep 1888, MA; d. Aft. 1940. 131. ii. HERMAN WESLEY LOVEWELL, b. 18 Jun 1891, Gardner MA; d. 07 Apr 1952. 70. ELMER LINCOLN7 LOVEWELL (LUCY6 STONE, BENJAMIN5, SAMUEL4, JOSEPH3, SIMON2, SIMON1) was born 06 Jun 1861 in Gardner MA, and died 27 Apr 1928 in Gardner MA. He married (1) MARY ANN COLEMAN 21 Nov 1885 in Templeton MA, daughter of PEREZ COLEMAN and PRUDENCE ?. She was born 30 Sep 1863 in Hubbardston MA, and died 1885. He married (2) INA MAUDE ENSOR 21 Aug 1901 in Gardner MA, daughter of JAMES ENSOR and SOPHRONIA ANDREWS. She was born Jun 1871 in Clyde River Nova Scotia, and died 1946.
i. ETHEL CAROLINE8 LOVEWELL, b. 30 Jul 1902, Philadelphia PA; d. 28 Apr 1986, Gardner MA. ii. NORMA DOLORES LOVEWELL, b. 28 Aug 1906, Gardner MA; d. 1958. 71. CHARLES EDWARD7 LOVEWELL (LUCY6 STONE, BENJAMIN5, SAMUEL4, JOSEPH3, SIMON2, SIMON1) was born 03 Oct 1863 in Gardner MA, and died Aft. 1920. He married NETTIE M HORTON 03 Oct 1891 in Gardner MA, daughter of ALFRED HORTON and MARY ?. She was born Oct 1870 in MA, and died Aft. 1920.
i. BESSIE A8 LOVEWELL, b. 15 Sep 1892, MA; d. 23 Dec 1980, Belmont MA. ii. STANLEY N LOVEWELL, b. Abt. 1902, Boston MA; d. 31 Aug 1902, Boston MA. iii. WALTER NELSON LOVEWELL, b. 11 Aug 1905, Boston MA; d. Aft. 1920. 72. ADA LILLIAN7 STONE (BRADLEY6, OLIVER5, SAMUEL4, JOSEPH3, SIMON2, SIMON1) was born Feb 1865 in Milford NH, and died 22 Jan 1933 in Steubenville OH. She married MAX VON GROSSMAN 15 Jun 1883 in Gilsum NH. He was born Apr 1857 in Germany, and died Aft. 1920.
i. BERTHA ELIZA8 GROSSMAN, b. 21 Nov 1884, Gilsum NH; d. 11 Sep 1887, Laconia NH. ii. GUSTAVE M GROSSMAN, b. 22 Oct 1887, Brookline/Laconia NH; d. Aft. 1910.
iii. LESLIE HOWARD GROSSMAN, b. 07 Aug 1890, Lynn MA; d. Aft. 1910.
iv. THEODORE ANTON GROSSMAN, b. 27 Dec 1892, Lynn MA; d. Aft. 1930.
v. IDA GROSSMAN, b. Oct 1896, PA; d. Aft. 1910.
vi. KARL GROSSMAN, b. Abt. 1901, PA; d. Aft. 1920. 132. vii. MARIE GROSSMAN, b. Abt. 1904, PA; d. Aft. 1930. 73. JONAS P7 HAYWARD (MARY S6 PATCH, MARY5 STONE, SAMUEL4, JOSEPH3, SIMON2, SIMON1) was born 18 Sep 1842 in Ashby MA, and died 29 Nov 1887 in Ashby MA. He married OLIVE FLORENCE GAGE 12 Jun 1866 in Cambridge MA. She was born 03 Sep 1841 in New London NH, and died Aft. 1920.
i. CHARLES M8 HAYWARD, b. 25 Dec 1868, Ashby MA; d. 22 Mar 1869, Ashby MA. 133. ii. MAUDE ISABEL HAYWARD, b. Abt. 1871, MA; d. Aft. 1940. 74. LYRA MARIA7 HAYWARD (MARY S6 PATCH, MARY5 STONE, SAMUEL4, JOSEPH3, SIMON2, SIMON1) was born 11 Mar 1852 in Ashby MA, and died 08 Nov 1915 in Lunenburg MA. She married WELLMAN J FISH 02 May 1878 in Ashby MA. He was born Jan 1853 in VT, and died Aft. 1940. 134. i. WILLIAM HAYWARD8 FISH, b. 08 Aug 1881, Ashby MA; d. Aft. 1930. 135. ii. MARY A FISH, b. 13 Oct 1883, Ashby MA; d. 14 Sep 1973, San Diego CA. 136. iii. ELMER WALLACE FISH, b. 01 Dec 1884, Ashby MA; d. Aft. 1942. 137. iv. EMMA LOUISA FISH, b. 20 Dec 1886, Leominster MA; d. 22 Oct 1915, Leominster MA. 138. v. ELSIE GERTRUDE FISH, b. 29 Mar 1890, Lunenburg MA; d. Aft. 1940. 139. vi. BERTHA EVELYN FISH, b. Aug 1893, Lunenburg MA; d. Aft. 1940. 75. BELINDA7 WHITNEY (ABIGAIL6 STONE, ABRAHAM5, SAMUEL4, JOSEPH3, SIMON2, SIMON1) was born 26 Oct 1842 in Wilbraham MA, and died Aft. 1900. She married CHARLES COESTER 22 Oct 1861 in Wilbraham MA. He was born Dec 1839 in NJ, and died Aft. 1900. 140. i. CHARLES FRED8 COESTER, b. Dec 1862, CT; d. Aft. 1920.
ii. FRANKLIN COESTER, b. Feb 1865, CT; d. Aft. 1900. 141. iii. ELLA E COESTER, b. Aug 1867, CT; d. Aft. 1900.
iv. ALFRED COESTER, b. 30 Jul 1874, Bridgeport CT; d. 04 Dec 1958, Santa Clara CA; m. BELLE HAVEN ? ; b. Abt. 1874, VT; d. Aft. 1930. 76. ABBY L7 WHITNEY (ABIGAIL6 STONE, ABRAHAM5, SAMUEL4, JOSEPH3, SIMON2, SIMON1) was born 12 Oct 1844 in Westminster MA, and died 24 Dec 1896 in Winchendon MA. She married EZRA S HUMES 06 Oct 1870 in Ashburnham MA, son of HENRY HUMES and ABIGAIL WESTON. He was born Mar 1849 in CT, and died Aft. 1910. 142. i. EDITH MABEL WHITNEY8 HUMES, b. 20 Jan 1872, Ashburnham MA; d. Aft. 1940.
ii. EDNA ALICE WHITNEY HUMES, b. 20 Jan 1872, Ashburnham MA; d. Aft. 1910. 143. iii. CARRIE E HUMES, b. Jul 1875, MA; d. Aft. 1940. 77. ANN J7 CONANT (LYDIA6 STONE, ABRAHAM5, SAMUEL4, JOSEPH3, SIMON2, SIMON1) was born May 1848 in Gardner MA, and died Aft. 1920. She married BURLEIGH F FRENCH. He was born Mar 1842 in NH, and died 16 Oct 1902 in Chicago IL. 144. i. FRANK BURLEIGH8 FRENCH, b. 04 Aug 1868, Templeton MA; d. Bet. 1898 - 1930.
ii. LILLIAN IRENE FRENCH, b. 18 Oct 1869, Templeton MA; d. 27 Jul 1870, Templeton MA. 145. iii. IRENE MARY FRENCH, b. 12 Sep 1873, Templeton MA; d. Aft. 1940. 78. CARRIE BELLE7 CONANT (LYDIA6 STONE, ABRAHAM5, SAMUEL4, JOSEPH3, SIMON2, SIMON1) was born 22 Jun 1859 in Templeton MA, and died Aft. 1920. She married HARRY BARTLETT 20 Jan 1888 in Templeton MA. He was born Apr 1865 in New Brunswick, and died Aft. 1920.
i. EARL ALBERT8 BARTLETT, b. 02 Nov 1888, Templeton MA; d. 01 Jul 1889, Templeton MA. 146. ii. FAYETTE CONANT BARTLETT, b. 23 May 1890, Templeton MA; d. Aft. 1940. 79. WILLIAM WALKER7 WHITE (MIRIAM6 WALKER, DIADAMIA5 STONE, SAMUEL4, JOSEPH3, SIMON2, SIMON1) was born Apr 1849 in Winchendon MA, and died Aft. 1920. He married (1) JENNIE V MOORE 23 Dec 1871 in Webster MA, daughter of DEXTER MOORE and MARY DODGE. She was born 18 Jun 1852 in Southbridge MA, and died 24 Feb 1912 in Worcester MA. He married (2) ELLA MAY HARNEY 26 Aug 1914 in West Boylston MA. She was born Abt. 1885 in MA, and died Aft. 1930.
i. WILLIAM DEXTER8 WHITE, b. 24 Aug 1876, Webster MA; d. Aft. 1930; m. EDITH GEORGIANNA BLISS, 16 Sep 1902, Worcester MA; b. Abt. 1879, MA; d. Aft. 1930. 80. EMMA A7 WHITE (MIRIAM6 WALKER, DIADAMIA5 STONE, SAMUEL4, JOSEPH3, SIMON2, SIMON1) was born Abt. 1852 in Winchendon MA, and died Aft. 1880. She married DWIGHT LESLIE MASON 01 Jan 1874 in Winchedon MA. He was born 11 Jul 1852 in Boston MA, and died Bet. 1910 - 1920. 147. i. ORLANDO WHITE8 MASON, b. 17 Feb 1877, Winchendon MA; d. Aft. 1940.
ii. JOSEPHINE DWIGHT MASON, b. 28 Feb 1879, Winchendon MA; d. Aft. 1930. 81. JOSEPH E7 WHITE (MIRIAM6 WALKER, DIADAMIA5 STONE, SAMUEL4, JOSEPH3, SIMON2, SIMON1) was born May 1854 in MA, and died Aft. 1940. He married LUCY E JOHNSON 23 Jun 1897 in Hamilton OH. She was born Apr 1871 in OH, and died Aft. 1940.
i. LUCY ESTABROOK8 WHITE, b. 24 Aug 1898, MA; d. Aft. 1910.
ii. MIRIAM W WHITE, b. Dec 1899, OH; d. Aft. 1940. 82. JOHN A7 WHITE (MIRIAM6 WALKER, DIADAMIA5 STONE, SAMUEL4, JOSEPH3, SIMON2, SIMON1) was born 09 Aug 1859 in West Boylston MA, and died Aft. 1940. He married (1) TONI LILLIE ?. She was born Abt. 1909 in Germany, and died Aft. 1940. He married (2) FLORENCE E HERRON 11 Feb 1885 in Southbridge MA. She was born Jun 1862 in MA, and died Aft. 1930.
i. JOHN WINDSOR8 WHITE, b. 08 Aug 1894, Winchendon MA; d. Aft. 1920. 83. WILLIAM E7 PARKER (EMILY6 WALKER, DIADAMIA5 STONE, SAMUEL4, JOSEPH3, SIMON2, SIMON1) was born Abt. 1861 in NH/ME, and died Bet. 1920 - 1930. He married LUNA F KEYES 14 Feb 1883 in West Boylston MA. She was born Abt. 1858 in MA, and died Aft. 1940. 148. i. ROLAND KEYES8 PARKER, b. 14 Sep 1887, Haverhill MA; d. Aft. 1940. 149. ii. AMOS CLAYTON PARKER, b. 22 Aug 1885, Haverhill MA; d. Aft. 1940. 84. NELLIE G7 MERRIAM (LUCY6 WALKER, DIADAMIA5 STONE, SAMUEL4, JOSEPH3, SIMON2, SIMON1) was born Abt. 1854 in Sterling MA, and died Aft. 1930. She married AARON GOODALE 14 Feb 1873 in West Boylston MA, son of AARON GOODALE and ELIZABETH FALER. He was born 30 Nov 1851 in West Boylston MA, and died 17 Aug 1911 in West Boylston MA. 150. i. LEON ARVINE8 GOODALE, b. 01 Mar 1876, West Boylston MA; d. Aft. 1940. 151. ii. HATTIE LOUISA GOODALE, b. 03 May 1883, West Boylston MA; d. Aft. 1940. 152. iii. AARON GOODALE, b. 24 Jun 1889, West Boylston MA; d. Aft. 1940. 153. iv. DWIGHT MERRIAM GOODALE, b. 24 Aug 1897, West Boylston MA; d. 22 Jan 1985, Worcester MA. 85. EDITH MAY7 WALKER (ALVA STONE6, DIADAMIA5 STONE, SAMUEL4, JOSEPH3, SIMON2, SIMON1) was born May 1867 in IN, and died Aft. 1910. She married (1) ROBERT H MCNALL. He was born Nov 1865 in NY, and died Aft. 1912. She married (2) BENJAMIN FRANKLIN HOOPER 14 Jun 1888 in Manhatten NY. He was born 30 Jun 1857 in NY, and died 20 Apr 1902.
i. EMILY M8 HOOPER, b. Mar 1889, NY; d. Aft. 1910.
ii. JOHN STANLEY HOOPER, b. 02 Aug 1890, NYC; d. Aft. 1910. 154. iii. FRANKLIN WALKER HOOPER, b. 06 Sep 1894, Larchmont NY; d. Aft. 1940.
iv. GRACE D HOOPER, b. Jun 1899, NY/CT; d. Aft. 1910. 86. FREDERICK H7 WALKER (ALVA STONE6, DIADAMIA5 STONE, SAMUEL4, JOSEPH3, SIMON2, SIMON1) was born Jul 1870 in IN, and died Aft. 1920. He married LILLIAN H ? Abt. 1897. She was born Feb 1870 in PA, and died Aft. 1920. 155. i. ALVA S8 WALKER, b. Oct 1897, NY; d. Aft. 1940.
ii. HOWARD R WALKER, b. Feb 1900, NY; d. Aft. 1920. 156. iii. RICHARD H WALKER, b. Abt. 1902, NY; d. Aft. 1940.
iv. BEATRICE WALKER, b. Abt. 1906, CT; d. Aft. 1920. 87. ERVIN D7 HOLBROOK (MARTHA WILDER6 WALKER, DIADAMIA5 STONE, SAMUEL4, JOSEPH3, SIMON2, SIMON1) was born Dec 1859 in MA, and died Aft. 1930. He married FLORA ESTELLE WHITTEMORE 17 Jun 1883 in Holden MA, daughter of HEZEKIAH WHITTEMORE and MARGARET STOVERS. She was born 30 Jul 1864 in West Boylston MA, and died Bet. 1920 - 1930. 157. i. MARTHA AGNES8 HOLBROOK, b. 13 Jun 1884, Gardner MA; d. Aft. 1940. 158. ii. FRANK ERVIN HOLBROOK, b. 28 Sep 1885, Holden MA; d. Aft. 1930.
iii. BLANCHE EDITH HOLBROOK, b. 20 Sep 1887, West Boylston MA; d. Aft. 1940; m. HERBERT COOPER WELLS, 05 Dec 1909, Worcester MA; b. Abt. 1890, MA; d. Aft. 1940.
iv. CHILD HOLBROOK, b. Abt. 03 Jun 1890, Holden MA; d. 09 Jun 1890, Holden MA. v. WILLIAM FOREST HOLBROOK, b. 05 Oct 1891, Holden MA; d. Aft. 1917. 159. vi. WALTER GRANT HOLBROOK, b. 12 May 1894, Holden MA; d. Bet. 1930 - 1940. 160. vii. RALPH EUGENE HOLBROOK, b. 03 Jun 1897, Worcester MA; d. Aft. 1940.
viii. PEARL ETHEL HOLBROOK, b. 13 Sep 1899, Oxford MA; d. Aft. 1920. 88. WILLIAM LEVI7 HOLBROOK (MARTHA WILDER6 WALKER, DIADAMIA5 STONE, SAMUEL4, JOSEPH3, SIMON2, SIMON1) was born 17 Aug 1862 in MA, and died Aft. 1940. He married MARY BOARDMAN. She was born Abt. 1880 in England, and died Bet. 1930 - 1940. 161. i. FLORENCE G8 HOLBROOK, b. Abt. 1912, MA; d. Aft. 1940.
ii. WALTER HOWARD HOLBROOK, b. 19 May 1914, Holden MA; d. Aft. 1940.
iii. CHARLES RAYMOND HOLBROOK, b. 07 Aug 1915, Holden MA; d. 05 Sep 1915, Holden MA. iv. MARTHA M HOLBROOK, b. Abt. 1917, MA; d. Aft. 1940. 89. SYLVESTER GRISWOLD7 COMEE (CHRISTOPHER COLUMBUS6, MERRIAM5 STONE, SAMUEL4, JOSEPH3, SIMON2, SIMON1) was born Apr 1853 in NY, and died 18 May 1926 in Minneapolis MN. He married ALICE ROONEY 28 Nov 1893 in Hennepin MN. She was born Jul 1859 in MN, and died Aft. 1940.
i. DAUGHTER8 COMEE, b. Minneapolis MN; d. 23 Jun 1895, Minneapolis MN. 162. ii. FRED THOMAS COMEE, b. 27 May 1897, Minneapolis MN; d. Aft. 1940.
iii. ALLAN JOSEPH COMEE, b. 03 Apr 1900, Minneapolis MN; d. Aft. 1942; m. ? ?, Later divorced. iv. VINCENT M COMEE, b. Abt. 1906, MN; d. Aft. 1940. 90. JOSEPH FRED7 COMEE (CHRISTOPHER COLUMBUS6, MERRIAM5 STONE, SAMUEL4, JOSEPH3, SIMON2, SIMON1) was born 19 Oct 1869 in Wasecea MN, and died 23 Jul 1943 in Evanston IL. He married BEULAH M ?. She was born Abt. 1883 in NE, and died Aft. 1940.
i. THELMA8 COMEE, b. Abt. 1903, MT; d. Aft. 1920.
ii. LESTER H COMEE, b. Abt. 1910, PA; d. Aft. 1940.
iii. LOWELL M COMEE, b. Abt. 1913, IL; d. Aft. 1940. 91. MYRA A7 COMEE (SAMUEL S6, MERRIAM5 STONE, SAMUEL4, JOSEPH3, SIMON2, SIMON1) was born Sep 1860 in NY, and died Aft. 1930. She married ORRIN L ROBINSON Abt. 1888. He was born 02 Oct 1857 in Norfolk NY, and died 30 Nov 1937 in Jacksonville FL. i. MIRIAM8 ROBINSON, b. 20 Sep 1889, Elroy WI; d. Aft. 1910.
ii. ARTHUR HARRISON ROBINSON, b. 09 Sep 1892, Baraboo WI; d. Aft. 1920.
iii. THEODORE DAY ROBINSON, b. 25 Oct 1898, WI; d. Aft. 1920. 92. MARTHA J7 COMEE (SAMUEL S6, MERRIAM5 STONE, SAMUEL4, JOSEPH3, SIMON2, SIMON1) was born Oct 1862 in NY, and died Bet. 1920 - 1930. She married CHARLES E LESLIE Abt. 1882. He was born Jul 1854 in VT, and died Aft. 1930.
i. CHARLES C8 LESLIE, b. 28 Aug 1883, Waseca MN; d. Aft. 1910. 163. ii. MYRON FREDERICK LESLIE, b. 05 Sep 1885, MN; d. Aft. 1940.
iii. RUTH ELIZABETH LESLIE, b. 15 Jul 1887, Waseca MN; d. Aft. 1910. 93. CLARENCE NELSON8 STONE (BAMAN NELSON7, NELSON6, EUNICE5, SAMUEL4, JOSEPH3, SIMON2, SIMON1) was born 24 Jul 1883 in ME, and died Aft. 1940. He married HELEN M ?. She was born Abt. 1881 in MA, and died Aft. 1940.
i. STEWART R9 STONE, b. Abt. 1907, MA; d. Aft. 1920. 94. PHOEBE H8 STONE (MARTHA JANE7, NELSON6, EUNICE5, SAMUEL4, JOSEPH3, SIMON2, SIMON1) was born May 1882 in MA, and died Aft. 1940. She married ? ?. i. WINIIFRED9 STONE, b. 15 Feb 1909, Wareham MA; d. Aft. 1920. 95. EMMA G8 PETTEGREW (MARTHA JANE7 STONE, NELSON6, EUNICE5, SAMUEL4, JOSEPH3, SIMON2, SIMON1) was born Sep 1866 in Claremont NH, and died Bet. 1920 - 1930. She married ALBERT HUMPHREY 11 Jan 1892 in Phillipston MA. He was born Dec 1855 in Wareham MA, and died Aft. 1930.
i. MARY EVENA9 HUMPHREY, b. 21 Feb 1893, Wareham MA; d. 10 Dec 1907, Wareham MA. ii. LAURENCE E HUMPHREY, b. 02 Nov 1899, Wareham MA; d. Aft. 1920.
iii. MARIAN GAUTHIER HUMPHREY, b. Abt. 1902, MA - adopted; d. Aft. 1920.
iv. ROBERT C HUMPHREY, b. Abt. 1903, MA; d. Aft. 1920.
v. GEORGE ALBERT HUMPHREY, b. 26 Dec 1904, Wareham MA; d. Aft. 1920.
vi. HELEN EVANS HUMPHREY, b. 19 Jul 1912, Wareham MA; d. Aft. 1930. 96. JACOB WESLEY W8 SANDERSON (CATHERINE AUGUSTA7 STONE, NELSON6, EUNICE5, SAMUEL4, JOSEPH3, SIMON2, SIMON1) was born 17 Mar 1868 in Phillipston MA, and died 07 Sep 1963 in Washington County OR. He married (1) LILLIE ANN ALLINGER. She was born 17 Sep 1900 in MO, and died 06 Jun 1979 in Multnomah County OR. He married (2) MARGARET F MILLARD 02 Jun 1891 in Phillipston/Springfield MA - later divorced. She was born Mar 1874 in MA, and died Aft. 1920. 164. i. CLIFFORD WESLEY9 SAUNDERSON, b. 03 Jul 1894, Phillipston MA; d. 03 Feb 1982, Parma OH. 97. BENJAMIN F BUTLER8 SANDERSON (CATHERINE AUGUSTA7 STONE, NELSON6, EUNICE5, SAMUEL4, JOSEPH3, SIMON2, SIMON1) was born 23 Apr 1883 in Westford MA, and died Aft. 1940. He married FLORENCE G MONTGOMERY 20 Jun 1904 in Enfield MA, daughter of DANIEL MONTGOMERY and FLORENCE HATHAWAY. She was born Abt. 1884 in Enfield MA, and died Aft. 1940.
i. PEARL EVELYN9 SANDERSON, b. 16 Mar 1905, Enfield MA; d. Aft. 1930.
ii. DAUGHTER SANDERSON, b. 04 Apr 1909, Gardner MA; d. Bef. 1910.
iii. RUBY A SANDERSON, b. Abt. 1912, CT; d. Aft. 1930.
iv. BENJAMIN F SANDERSON, b. Abt. 1915, CT; d. Aft. 1930.
v. WILFRED E SANDERSON, b. Abt. 1919, CT; d. Aft. 1940.
vi. CLARENCE E SANDERSON, b. Abt. 1922, MA; d. Aft. 1940.
vii. BERTRAND D SANDERSON, b. Abt. 1926, MA; d. Aft. 1940. 98. NELSON8 STONE (ALMON HUMPHREY7, NELSON6, EUNICE5, SAMUEL4, JOSEPH3, SIMON2, SIMON1) was born 09 Sep 1891 in Wareham MA, and died 03 May 1982 in Barnstable MA. He married MARION HEERMANS 19 Dec 1917 in Steuben NY. She was born Abt. 1893 in NY, and died Aft. 1940.
i. NANCY H9 STONE, b. Abt. 1936, NY; d. Aft. 1940. 99. LEILA GRACE8 STONE (HENRY J7, ANDREW JACKSON6, EUNICE5, SAMUEL4, JOSEPH3, SIMON2, SIMON1) was born 04 Oct 1873 in Chelsea MA, and died Aft. 1940. She married ALLISON C SMITH 12 Sep 1900 in Malden MA. He was born Abt. 1875 in Canada, and died Aft. 1940.
i. CLYDE F9 SMITH, b. 25 Jan 1905, Malden MA; d. Aft. 1920. 100. ANNA EVELYN8 SMART ((HATTIE) ELLA MARIA7 STONE, ANDREW JACKSON6, EUNICE5, SAMUEL4, JOSEPH3, SIMON2, SIMON1) was born 16 May 1878 in Medford MA, and died Aft. 1940. She married WALTER IRVING WESCOTT 26 Jul 1905 in Framingham MA - later divorced. He was born 07 Nov 1876 in West Medford MA, and died 07 Oct 1948 in San Luis Obispo CA. 165. i. MARGARET MONA9 WESCOTT, b. 30 Apr 1906, Cambridge MA; d. Aft. 1940.
ii. WINIFRED EVELYN WESCOTT, b. 22 Jul 1907, Framingham MA; d. Aft. 1940; m. VINCENT W DINAN; b. Abt. 1907, Canada; d. Aft. 1940.
iii. ELEANOR IRVING WESCOTT, b. 07 Jul 1909, Framingham MA; d. Aft. 1920.
iv. RICHARD GARDNER WESCOTT, b. 08 Oct 1910, Framingham MA; d. Aft. 1930. 101. HERBERT LEIGHTON8 SMART ((HATTIE) ELLA MARIA7 STONE, ANDREW JACKSON6, EUNICE5, SAMUEL4, JOSEPH3, SIMON2, SIMON1) was born 30 May 1889 in Chelsea MA, and died Aft. 1942. He married MAUD E ?. She was born Abt. 1887 in England, and died Aft. 1940.
i. HARRIET S9 SMART, b. Abt. 1918, MA; d. Aft. 1940.
ii. VIRGINIA B SMART, b. Abt. 1920, MA; d. Aft. 1940.
iii. FREDERICK L SMART, b. Abt. 1921, MA; d. Aft. 1940.
iv. SHIRLEY E SMART, b. Abt. 1922, MA; d. Aft. 1940.
v. ALMA L SMART, b. Abt. 1923, MA; d. Aft. 1940.
vi. LLOYD W SMART, b. Abt. 1925, MA; d. Aft. 1940. 102. JOSEPH EMERSON8 STONE (ELMER JOSEPH7, JOSEPH6, SAMUEL5, SAMUEL4, JOSEPH3, SIMON2, SIMON1) was born Jul 1868 in Litchfield MN, and died 07 Aug 1941 in Meeker County MN. He married ELSIE IRENE CHADWICK. She was born 19 Feb 1877 in Cedar Mills MN, and died 23 Jan 1945.
i. CAROL E9 STONE, b. Abt. 1905, MN; d. Aft. 1930.
ii. MYRTLE M STONE, b. Abt. 1907, MN; d. Aft. 1930.
iii. MARGARET S STONE, b. Abt. 1912, MN; d. Aft. 1930.
iv. LLOYD E STONE, b. Abt. 1915, MN; d. Aft. 1930. 103. CARLOS8 AVERY (MARY ANN7 STONE, JOSEPH6, SAMUEL5, SAMUEL4, JOSEPH3, SIMON2, SIMON1) was born 25 Jan 1868 in Minooka IL, and died 05 Oct 1930 in Long island City NY. He married EMMA I PENNOYER Abt. 1893, daughter of HARMON PENNOYER and MARY ?. She was born 26 May 1869 in MN, and died 15 Nov 1961.
i. MARY9 AVERY, b. Jun 1894, MN; d. Aft. 1910.
ii. HELEN AVERY, b. Abt. 1901, MN; d. Aft. 1930. 104. AMOS FRANKLIN8 AVERY (MARY ANN7 STONE, JOSEPH6, SAMUEL5, SAMUEL4, JOSEPH3, SIMON2, SIMON1) was born 18 Dec 1883 in MN, and died 28 Apr 1914 in Stewart MN. He married GRACE ESTELLA EYNON. She was born 26 Jul 1884 in MN, and died 26 Feb 1967. 166. i. CARLOS ARTHUR9 AVERY, b. 09 May 1907, MN; d. 09 May 1976, Pope MN. 105. ARTHUR MARK8 STONE (SHELDON C7, JOSEPH6, SAMUEL5, SAMUEL4, JOSEPH3, SIMON2, SIMON1) was born 1872 in MN, and died 30 Apr 1922 in Acoma MN. He married ADA ALICE BELL Abt. 1900. She was born Nov 1877 in MN, and died 28 Jul 1959.
i. LINNE ALICE9 STONE, b. 14 Aug 1904, MN; d. 02 Aug 1936; m. ? POTTER. ii. SHELDON WALLACE STONE, b. 1915, MN; d. 12 Jun 1940.
iii. ETHEL RUTH STONE, b. Abt. 1918, MN; d. Aft. 1930. 106. FRANKLIN S8 HARSEN (JULIA ESTHER7 STONE, JOSEPH6, SAMUEL5, SAMUEL4, JOSEPH3, SIMON2, SIMON1) was born 29 Nov 1883 in MN, and died 11 Feb 1968 in Los Angeles CA. He married HAZEL D JACOBSON. She was born Abt. 1889 in UT, and died Aft. 1920.
i. CONSTANCE M9 HARSEN, b. Abt. 1908, ID; d. Aft. 1920.
ii. MAX HAROLD HARSEN, b. 04 Oct 1909, Boise ID; d. 17 Jul 1984, Los Angeles CA. 107. MAX RICHARD8 IKEN (JULIA ESTHER7 STONE, JOSEPH6, SAMUEL5, SAMUEL4, JOSEPH3, SIMON2, SIMON1) was born 14 May 1893 in Cedar Mills MN, and died 19 Apr 1970 in Beltrami MN. He married VEARL JACKSON. She was born 22 Aug 1897 in MN, and died Feb 1987 in Beltrami MN. i. MAXINE FRANCES9 IKEN, b. 22 Aug 1939, McLeod MN; d. Bef. 1940. 108. JUDSON NORTON8 STONE (FRANKLIN7, REUBEN6, JOSIAH5, SAMUEL4, JOSEPH3, SIMON2, SIMON1) was born 18 Apr 1862 in Pittsfield OH, and died 15 Apr 1950 in OH. He married (1) GERTRUDE DIXSON. She was born Abt. 1875 in OH, and died Aft. 1940. He married (2) IDA E PROBERT 18 Apr 1883 in Lorain OH. She was born 11 Dec 1859 in Pittsfield OH, and died 30 Jan 1912 in Oberlin OH. 167. i. PAUL JAMES9 STONE, b. 07 Jun 1914, Oberlin OH; d. 02 Feb 1999, Lorain OH. 168. ii. DOROTHY H STONE, b. 28 May 1916, OH; d. 17 Aug 2011, Ashland OH. iii. IDA FLOREDA9 STONE, b. 22 Mar 1884, Oberlin OH; d. 28 May 1952, Lakewood OH. iv. FRANK P STONE, b. 05 Jul 1886, Russia OH; d. 30 Oct 1909, Oberlin OH. v. DAUGHTER STONE, b. 19 Mar 1892, Cleveland OH. 169. vi. CHARLES W STONE, b. 28 Sep 1894, Oberlin OH; d. Aft. 1940. 170. vii. ROBERT JOHN STONE, b. 13 Nov 1897, Oberlin OH; d. 05 Nov 1983, Berea OH. 109. EMERSON ERASTUS8 STONE (FRANKLIN7, REUBEN6, JOSIAH5, SAMUEL4, JOSEPH3, SIMON2, SIMON1) was born Nov 1865 in OH, and died 03 Nov 1921 in Modesto CA. He married EMMA A SARGENT (SANGER) Abt. 1887. She was born Dec 1868 in Osceola IA, and died 06 Jan 1940 in Oakland CA. 171. i. ROY EMERSON9 STONE, b. 01 Jul 1887, MO; d. 21 Nov 1955, Napa CA. 172. ii. VIOLA LENORA STONE, b. May 1889, MO; d. Aft. 1930. 173. iii. EILEEN GRACE STONE, b. 26 Nov 1891, MO; d. 12 Oct 1984, Stanislaus CA. 174. iv. CHARLES HAROLD STONE, b. 12 May 1894, Nelson NE; d. 27 Apr 1967, San Francisco CA. v. LUCY M STONE, b. Nov 1895, MO; d. Aft. 1920.
vi. FRANK STONE, b. May 1900, MO; d. Aft. 1900. 175. vii. JUDSON NORTON STONE, b. 05 Jun 1900, MO; d. 01 Apr 1972, Stanislaus CA. viii. EMERY E STONE, b. 04 Jun 1903, KS; d. 20 Oct 1977, Orange CA. ix. LORETTA M STONE, b. Abt. 1906, KS; d. Aft. 1920.
x. ROBERT MARIAN STONE, b. 06 Feb 1907, KS; d. 01 Jul 1995, Turlock Stanislaus CA. xi. WARREN ALBERT STONE, b. 02 Oct 1909, Fresno CA; d. 11 Apr 1980, Alameda CA. 110. MARK A8 STONE (FRANKLIN7, REUBEN6, JOSIAH5, SAMUEL4, JOSEPH3, SIMON2, SIMON1) was born 22 Jan 1868 in Pittsfield OH, and died 1920. He married MARGARET A YOUST 13 Sep 1893 in Cuyahoga OH. She was born 23 Mar 1873 in Cleveland OH, and died Aft. 1940.
i. MILDRED M9 STONE, b. Jul 1894, OH; d. Aft. 1940. 111. CLYDE LOTTRIDGE8 CUMMER (ABBIE7 STONE, REUBEN6, JOSIAH5, SAMUEL4, JOSEPH3, SIMON2, SIMON1) was born 23 Feb 1882 in Cadillac MI, and died 07 Jun 1958 in Cleveland OH. He married MARIANNE D NORTH 25 Feb 1915 in Cuyahoga OH. She was born Abt. 1881 in OH, and died 23 Dec 1964 in Cleveland OH. i. ROBERT N9 CUMMER, b. 28 Jan 1917, OH; d. 04 Apr 1977, New Hope GA.
ii. MARIENNE CUMMER, b. 17 Oct 1920, Cleveland OH; d. 17 Oct 1920, Cleveland OH. iii. KATHRYN A CUMMER, b. Abt. 1923, OH; d. Aft. 1940. 112. WILLIS REUBEN8 HAYNES (REUBEN WESLEY7, REUBEN6, MARTHA5 STONE, SAMUEL4, JOSEPH3, SIMON2, SIMON1) was born 13 May 1865 in Leominster MA, and died Bet. 1920 - 1930. He married TRESSIE E WOOD 03 Feb 1892 in Leominster MA. She was born May 1871 in Nova Scotia, and died Aft. 1930. 176. i. STEPHEN WESLEY9 HAYNES, b. 02 Sep 1892, Leominster MA; d. 07 Nov 1983, Fitchburg MA. 113. ELMER HENRY8 BOUTELLE (MARTHA7 POWERS, MARY6 HAYNES, MARTHA5 STONE, SAMUEL4, JOSEPH3, SIMON2, SIMON1) was born 09 Mar 1876 in Leominster MA, and died Aft. 1940. He married MABEL E BURNAP 17 Oct 1906 in Leominster MA. She was born Abt. 1881 in MA, and died Aft. 1940.
i. MARIEL ELIZABETH9 BOUTELLE, b. 08 Feb 1908, Leominster MA; d. Aft. 1940. 114. ALBERT ARTHUR8 BOUTELLE (MARTHA7 POWERS, MARY6 HAYNES, MARTHA5 STONE, SAMUEL4, JOSEPH3, SIMON2, SIMON1) was born 14 Jul 1878 in Leominster MA, and died Aft. 1942. He married ANNA DELANA BEAMAN 24 Jul 1901 in Leverett MA. She was born Abt. 1879 in Leverett MA, and died Aft. 1940.
i. RUTH AGNES9 BOUTELLE, b. 23 Jun 1902, Leominster MA; d. 15 Oct 1902, Leominster MA. ii. SON BOUTELLE, b. Abt. 1904, Leverett MA; d. 06 Oct 1904, Leverett MA. iii. GLADYS IRENE BOUTELLE, b. 29 Jun 1906, Leominster MA; d. Aft. 1920.
iv. DAUGHTER BOUTELLE, b. Abt. 1910, ? Weston MA; d. 16 Apr 1910, Weston MA. v. DAUGHTER BOUTELLE, b. 02 Apr 1913, Canton MA; d. 02 Apr 1913, Canton MA. vi. SON BOUTELLE, b. 05 Sep 1915, Canton MA; d. 05 Sep 1915, Canton MA. 115. CLARENCE ALFRED8 BOUTELLE (MARTHA7 POWERS, MARY6 HAYNES, MARTHA5 STONE, SAMUEL4, JOSEPH3, SIMON2, SIMON1) was born 01 Aug 1881 in Leominster MA, and died Aft. 1920. He married ETHEL IRENE BARR 12 Nov 1902 in Spencer MA, daughter of STEPHEN S BARR. She was born Abt. 1880 in MA, and died Aft. 1940.
i. ERNESTINE I9 BOUTELLE, b. Abt. 1905, NY; d. Aft. 1920. 116. MINOT LEGATE8 POWERS (EZRA WILLIS7, MARY6 HAYNES, MARTHA5 STONE, SAMUEL4, JOSEPH3, SIMON2, SIMON1) was born 06 Jun 1888 in Leominster MA, and died Aft. 1940. He married ESTHER J GREENLAW 20 Jul 1910 in Leominster MA. She was born Abt. 1894 in MA, and died Aft. 1940. 177. i. RUTH LOUISE9 POWERS, b. 14 Jul 1913, Leominster MA; d. Aft. 1920.
ii. ESTHER LEORA POWERS, b. 23 Jun 1915, Leominster MA; d. Aft. 1920.
iii. MINOT L POWERS, b. Abt. 1919, MA; d. Aft. 1940.
iv. STANLEY W POWERS, b. Abt. 1928, MA; d. Aft. 1940. 117. GURDON FREMONT8 POWERS (EZRA WILLIS7, MARY6 HAYNES, MARTHA5 STONE, SAMUEL4, JOSEPH3, SIMON2, SIMON1) was born 12 Jan 1895 in Leominster MA, and died Aft. 1940. He married (1) EVLYN ?. She was born Abt. 1898 in MA, and died Bet. 1921 - 1930. He married (2) MABEL H ?. She was born Abt. 1900 in MA, and died Aft. 1940.
i. GURDON F9 POWERS, b. 25 Jul 1918, MA; d. 06 Jan 1996, Fitchburg MA. ii. JANETTE E POWERS, b. Abt. 1921, MA; d. Aft. 1930.
iii. CAROL A9 POWERS, b. Abt. 1937, MA; d. Aft. 1940. 118. EMMA LOUISE8 POWERS (EDWIN UPTON7, MARY6 HAYNES, MARTHA5 STONE, SAMUEL4, JOSEPH3, SIMON2, SIMON1) was born Dec 1881 in Leominster MA, and died Aft. 1930. She married MANLEY GATES HATSTAT 06 Nov 1901 in Leominster MA. He was born 10 Apr 1884 in Athol MA, and died Aft. 1942.
i. HELEN LOUISE9 HATSTAT, b. 11 Mar 1903, Leominster MA; d. Aft. 1910.
ii. SON HATSTAT, b. 25 Mar 1903, Leominster MA; d. 25 Mar 1903, Leominster MA. iii. GRACE HATSTAT, b. 21 Jan 1905, Leominster MA; d. 22 Jan 1905, Leominster MA. iv. GERTRUDE HATSTAT, b. 21 Jan 1905, Leominster MA; d. 23 Jan 1905, Leominster MA. v. DOROTHY HATSTAT, b. Abt. 1917, MA; d. Aft. 1930.
vi. EDNA HATSTAT, b. Abt. 1918, MA; d. Aft. 1930.
vii. EDWIN HATSTAT, b. Abt. 1920, MA; d. Aft. 1930. 119. FREDERICK EMERSON8 POWERS (EDWIN UPTON7, MARY6 HAYNES, MARTHA5 STONE, SAMUEL4, JOSEPH3, SIMON2, SIMON1) was born 30 Oct 1884 in Leominster MA, and died Aft. 1930. He married MARTHA ?. She was born Abt. 1891 in England, and died Aft. 1930.
i. MINNIE E9 POWERS, b. Abt. 1923, MA; d. Aft. 1930. 120. HAROLD ELMER8 POWERS (ELMER ELLSWORTH7, MARY6 HAYNES, MARTHA5 STONE, SAMUEL4, JOSEPH3, SIMON2, SIMON1) was born 13 May 1890 in Leominster MA, and died Aft. 1940. He married SYLVIA FIELDING 02 Dec 1910 in Leominster MA. She was born Abt. 1891 in MA, and died Aft. 1940.
i. HAROLD F9 POWERS, b. Abt. 1919, MA; d. Aft. 1940.
ii. GRACE S POWERS, b. Abt. 1927, MA; d. Aft. 1940.
iii. SHIRLEY M POWERS, b. Abt. 1935, MA; d. Aft. 1940. 121. ERNEST TYLER8 POWERS (ELMER ELLSWORTH7, MARY6 HAYNES, MARTHA5 STONE, SAMUEL4, JOSEPH3, SIMON2, SIMON1) was born 29 May 1894 in Leominster MA, and died Aft. 1940. He married HAZEL D WHEELER. She was born Abt. 1899 in MA, and died Aft. 1940.
i. DORIS L9 POWERS, b. Abt. 1922, MA; d. Aft. 1940. 122. ALVIN WILLIAM8 COOLIDGE (WILLIAM FLETCHER7, JOHN WESLEY6, MARTHA5 STONE, SAMUEL4, JOSEPH3, SIMON2, SIMON1) was born 05 Aug 1889 in West Boylston MA, and died Aft. 1940. He married LOUISA A LYNCH 03 Aug 1921 in Billings MT. She was born Abt. 1891 in MA, and died Aft. 1940.
i. KATHLEEN L9 COOLIDGE, b. Abt. 1923, MT; d. Aft. 1940.
ii. DEAN R COOLIDGE, b. Abt. 1925, MT; d. Aft. 1940. 123. DORIS SYLVIA8 COOLIDGE (WILLIAM FLETCHER7, JOHN WESLEY6, MARTHA5 STONE, SAMUEL4, JOSEPH3, SIMON2, SIMON1) was born May 1895 in MA, and died 25 Dec 1947 in Peterborough NH. She married DAVID L HARLING 23 Oct 1929 in East Jaffrey NH. He was born Abt. 1896 in MA, and died Aft. 1940.
i. NATALIE ANN9 HARLING, b. Abt. 1937, NH; d. Aft. 1940. 124. ELEANOR C8 COOLIDGE (JOHN WESLEY7, JOHN WESLEY6, MARTHA5 STONE, SAMUEL4, JOSEPH3, SIMON2, SIMON1) was born Abt. 1903 in NH, and died Aft. 1940. She married EARLE W BROWN 03 Jun 1928 in Bristol NH, son of WALTER BROWN and IDA KALLENBERG. He was born Abt. 1903 in NH, and died Aft. 1940.
i. DONALD C9 BROWN, b. Abt. 1930, NH; d. Aft. 1940.
ii. MAXINE BROWN, b. Abt. 1931, NH; d. Aft. 1940.
iii. HILDA J BROWN, b. Abt. 1932, NH; d. Aft. 1940.
iv. GRETA E BROWN, b. Abt. 1935, NH; d. Aft. 1940. 125. IRMA8 COOLIDGE (JOHN WESLEY7, JOHN WESLEY6, MARTHA5 STONE, SAMUEL4, JOSEPH3, SIMON2, SIMON1) was born Abt. 1906 in NH, and died Aft. 1940. She married CARL C BROWN 14 Jul 1932 in Bristol NH, son of WALTER BROWN and IDA KALLENBERG. He was born Abt. 1906 in NH, and died Aft. 1940.
i. MARYLIN9 BROWN, b. Abt. 1936, NH; d. Aft. 1940.
ii. MILLICENT BROWN, b. Abt. 1939, NH; d. Aft. 1940. 126. GEORGE W8 COOLIDGE (HENRY ALBERT7, JOHN WESLEY6, MARTHA5 STONE, SAMUEL4, JOSEPH3, SIMON2, SIMON1) was born Abt. 1906 in NH, and died Aft. 1940. He married RUTH B ?. She was born Abt. 1905 in CT, and died Aft. 1940.
i. THEODORE CALVIN9 COOLIDGE, b. Abt. 1928, CT; d. Aft. 1940.
ii. GEORGIA MARY COOLIDGE, b. Abt. 1929, CT; d. Aft. 1940.
iii. ARTHUR ALBERT COOLIDGE, b. Abt. 1931, MA; d. Aft. 1940.
iv. CAROLYN COOLIDGE, b. Abt. 1936, CT; d. Aft. 1940.
v. KATHLEEN COOLIDGE, b. Abt. 1940, CT; d. Aft. 1940. 127. HARRY SYLVESTER8 STONE (JOHN CHARLES7, AI6, BENJAMIN5, SAMUEL4, JOSEPH3, SIMON2, SIMON1) was born 06 Sep 1874 in Gardner MA, and died Aft. 1940. He married BERNICE M PIEDALUE 10 Sep 1906 in Athol MA, daughter of HENRY PIEDALUE and JULIA RICHARDSON. She was born Abt. 1874 in MA, and died Aft. 1940.
i. WYMAN RICHARDSON9 STONE, b. 17 Mar 1909, Athol MA; d. Aft. 1930.
ii. PHILLIP CARLTON STONE, b. 24 Dec 1911, Athol MA; d. Aft. 1930. 128. MILO CALVIN8 STONE (JOHN CHARLES7, AI6, BENJAMIN5, SAMUEL4, JOSEPH3, SIMON2, SIMON1) was born 22 Nov 1878 in Gardner MA, and died Aft. 1930. He married MURIEL L BEMIS 07 May 1907 in Athol MA, daughter of ROGER BEMIS and MARY COLLER. She was born 01 Feb 1884 in Athol MA, and died Bet. 1910 - 1920.
i. SON9 STONE, b. 20 Feb 1908, Athol MA; d. 20 Feb 1908, Athol MA. ii. OLGA LOIS STONE, b. 25 Feb 1909, Athol MA; d. Aft. 1938; m. LEONIDAS JOSEPH GAUTHIER, 24 Jun 1938, Angola IN. 129. ALBERT HENRY8 STONE (REUBEN SYLVESTER7, AI6, BENJAMIN5, SAMUEL4, JOSEPH3, SIMON2, SIMON1) was born 08 Oct 1882 in Gardner MA, and died 02 Jun 1948. He married MARTHA A JONES 15 Jun 1909 in Leominster MA, daughter of GEORGE JONES and CAROLINE PROCTOR. She was born 15 Oct 1884 in Charlestown MA, and died 12 Jul 1959.
i. ALBERT HENRY9 STONE, b. 24 Feb 1912, Gardner MA; d. 24 Feb 1912, Gardner MA. ii. SON STONE, b. 03 Jan 1914, Gardner MA; d. 04 Jan 1914, Gardner MA. 130. AMY V8 LOVEWELL (JUDSON S7, LUCY6 STONE, BENJAMIN5, SAMUEL4, JOSEPH3, SIMON2, SIMON1) was born Sep 1888 in MA, and died Aft. 1940. She married PERCIVAL ROMINER LOVEWELL, son of ROMINER LOVEWELL and MARION COVELL. He was born 08 Jun 1891 in Chelsea MA, and died Aft. 1942.
i. PATRICIA GWENDOLYN9 LOVEWELL, b. Abt. 1921, MA; d. Aft. 1940. 131. HERMAN WESLEY8 LOVEWELL (JUDSON S7, LUCY6 STONE, BENJAMIN5, SAMUEL4, JOSEPH3, SIMON2, SIMON1) was born 18 Jun 1891 in Gardner MA, and died 07 Apr 1952. He married (1) BESSIE LUCIA ?. She was born 22 Apr 1894 in CT, and died 22 Nov 1930. He married (2) GLADYS J ?. She was born Abt. 1901 in MA, and died Aft. 1940.
i. GEORGE W9 LOVEWELL, b. Abt. 1924, MA; d. Aft. 1940.
ii. LAWRENCE E LOVEWELL, b. Abt. 1926, MA; d. Aft. 1940.
iii. JAMES H9 LOVEWELL, b. Abt. 1931, MA; d. Aft. 1940.
iv. CHARLES F LOVEWELL, b. Abt. 1932, MA; d. Aft. 1940.
v. RICHARD LOVEWELL, b. Abt. 1934, MA; d. Aft. 1940.
vi. BETTY ANN LOVEWELL, b. Abt. 1938, MA; d. Aft. 1940. 132. MARIE8 GROSSMAN (ADA LILLIAN7 STONE, BRADLEY6, OLIVER5, SAMUEL4, JOSEPH3, SIMON2, SIMON1) was born Abt. 1904 in PA, and died Aft. 1930. She married WALTER STONES. He was born Abt. 1902 in PA, and died Aft. 1930.
i. SHERMAN M9 STONES, b. Abt. 1921, PA; d. Aft. 1930.
ii. ADA C STONES, b. Abt. 1923, PA; d. Aft. 1930.
iii. DELORES I STONES, b. Abt. 1926, OH; d. Aft. 1930.
iv. THEODORE L STONES, b. Abt. 1928, PA; d. Aft. 1930.
v. EDWARD O STONES, b. Abt. 1930, OH; d. Aft. 1930. 133. MAUDE ISABEL8 HAYWARD (JONAS P7, MARY S6 PATCH, MARY5 STONE, SAMUEL4, JOSEPH3, SIMON2, SIMON1) was born Abt. 1871 in MA, and died Aft. 1940. She married HARRY WINSLOW MILLER 04 Jun 1894 in Westminster MA. He was born Abt. 1874 in MA, and died Aft. 1940. 178. i. GUY LEWIS9 MILLER, b. 14 Sep 1895, Westminster MA; d. Sep 1968, Worcester MA. ii. HENRY HAYWARD MILLER, b. 25 Jan 1898, MA; d. Aft. 1910. 134. WILLIAM HAYWARD8 FISH (LYRA MARIA7 HAYWARD, MARY S6 PATCH, MARY5 STONE, SAMUEL4, JOSEPH3, SIMON2, SIMON1) was born 08 Aug 1881 in Ashby MA, and died Aft. 1930. He married JENNIE DOHERTY 20 Jun 1906 in Lunenburg MA. She was born Abt. 1887 in Canada, and died Aft. 1930.
i. LAWRENCE WILLIAM9 FISH, b. 23 Jun 1907, Leominster MA; d. Aft. 1930.
ii. KENNETH DONALD FISH, b. 05 Oct 1909, Leominster MA; d. Aft. 1930.
iii. BERTRAM DOUTY FISH, b. 05 Sep 1911, Leominster MA; d. Aft. 1930. 135. MARY A8 FISH (LYRA MARIA7 HAYWARD, MARY S6 PATCH, MARY5 STONE, SAMUEL4, JOSEPH3, SIMON2, SIMON1) was born 13 Oct 1883 in Ashby MA, and died 14 Sep 1973 in San Diego CA. She married JOSEPH H COLEMAN 28 Nov 1901 in Fitchburg MA. He was born Abt. 1876 in Canada, and died Aft. 1930.
i. BERICE MYRTLE9 COLEMAN, b. 05 Apr 1909, Leominster MA; d. Aft. 1930.
ii. HAROLD EVERETT COLEMAN, b. 09 Oct 1912, Leominster MA; d. Aft. 1930.
iii. GORDON ALVIN COLEMAN, b. 16 Oct 1915, Leominster MA; d. Aft. 1930. 136. ELMER WALLACE8 FISH (LYRA MARIA7 HAYWARD, MARY S6 PATCH, MARY5 STONE, SAMUEL4, JOSEPH3, SIMON2, SIMON1) was born 01 Dec 1884 in Ashby MA, and died Aft. 1942. He married GERTRUDE M JOSLIN 02 Jun 1909 in Fitchburg MA. She was born Abt. 1884 in MA, and died Aft. 1940.
i. STANLEY JOSLIN9 FISH, b. 14 Jul 1912, Lunenburg MA; d. 30 Oct 1912, Lunenburg MA. 137. EMMA LOUISA8 FISH (LYRA MARIA7 HAYWARD, MARY S6 PATCH, MARY5 STONE, SAMUEL4, JOSEPH3, SIMON2, SIMON1) was born 20 Dec 1886 in Leominster MA, and died 22 Oct 1915 in Leominster MA. She married KINSMAN HICKS GREENOUGH 21 Jul 1906 in Lunenburg MA. He was born 22 Feb 1881 in Centerville Nova Scotia, and died Aft. 1942. 179. i. HARRY WELLMAN9 GREENOUGH, b. 05 Apr 1907, Lunenburg MA; d. Aft. 1940.
ii. HORACE HAYWARD GREENOUGH, b. 05 Apr 1907, Lunenburg MA; d. Aft. 1940; m. LAURA O ? ; b. Abt. 1911, MA; d. Aft. 1940.
iii. GERTRUDE VALENTINE GREENOUGH, b. 14 Feb 1909, Leominster MA; d. Aft. 1930. 180. iv. ELMER MAURICE GREENOUGH, b. 29 Apr 1910, Leominster MA; d. Aft. 1930. 181. v. HERMAN E GREENOUGH, b. 30 Nov 1911, MA; d. 08 May 1997, Roverside CA. vi. EDITH EVELYN GREENOUGH, b. 23 Mar 1913, Leominster MA. vii. LENA AGNES GREENOUGH, b. 21 Aug 1914, Leominster MA; d. Aft. 1930. 138. ELSIE GERTRUDE8 FISH (LYRA MARIA7 HAYWARD, MARY S6 PATCH, MARY5 STONE, SAMUEL4, JOSEPH3, SIMON2, SIMON1) was born 29 Mar 1890 in Lunenburg MA, and died Aft. 1940. She married ROY MARSHALL THOMAS 26 May 1915 in Fitchburg MA, son of FARWELL THOMAS and M MARSHALL. He was born 25 Dec 1891 in Worcester MA, and died Aft. 1940.
i. RUTH L9 THOMAS, b. Abt. 1917, MA; d. Aft. 1940; m. ROSCOE C STIDHAM; b. Abt. 1913, VA; d. Aft. 1940.
ii. ROGER W THOMAS, b. Abt. 1918, MA; d. Aft. 1930.
iii. R BARBARA THOMAS, b. Abt. 1920, MA; d. Aft. 1940. 139. BERTHA EVELYN8 FISH (LYRA MARIA7 HAYWARD, MARY S6 PATCH, MARY5 STONE, SAMUEL4, JOSEPH3, SIMON2, SIMON1) was born Aug 1893 in Lunenburg MA, and died Aft. 1940. She married CECIL FREEMONT PARMENTOR 26 May 1915 in Fitchburg MA. He was born Abt. 1888 in VT, and died Aft. 1940.
i. LYRA9 PARMENTOR, b. Abt. 1919, MA; d. Aft. 1930. 140. CHARLES FRED8 COESTER (BELINDA7 WHITNEY, ABIGAIL6 STONE, ABRAHAM5, SAMUEL4, JOSEPH3, SIMON2, SIMON1) was born Dec 1862 in CT, and died Aft. 1920. He married LILLIAN W ? Abt. 1887. She was born Jul 1863 in CT, and died Aft. 1920.
i. ALICE M9 COESTER, b. Oct 1895, CT; d. Aft. 1920. 141. ELLA E8 COESTER (BELINDA7 WHITNEY, ABIGAIL6 STONE, ABRAHAM5, SAMUEL4, JOSEPH3, SIMON2, SIMON1) was born Aug 1867 in CT, and died Aft. 1900. She married WILLIAM B GILBERT Abt. 1889. He was born Oct 1862 in CT, and died Aft. 1900.
i. NINA L9 GILBERT, b. Aug 1890, CT; d. Aft. 1900. 142. EDITH MABEL WHITNEY8 HUMES (ABBY L7 WHITNEY, ABIGAIL6 STONE, ABRAHAM5, SAMUEL4, JOSEPH3, SIMON2, SIMON1) was born 20 Jan 1872 in Ashburnham MA, and died Aft. 1940. She married EATON BENNETT MARSHALL 29 Oct 1895 in Pelham MA, son of ALDEN MARSHALL and CANDICE KNIGHT. He was born 01 May 1873 in Rutland VT, and died Aft. 1940.
i. RUTH EVELYN9 MARSHALL, b. 10 Feb 1897, West Pelham MA; d. Aft. 1920.
ii. MARIAN EDITH MARSHALL, b. 03 Apr 1900, Blandford MA; d. Aft. 1920. 143. CARRIE E8 HUMES (ABBY L7 WHITNEY, ABIGAIL6 STONE, ABRAHAM5, SAMUEL4, JOSEPH3, SIMON2, SIMON1) was born Jul 1875 in MA, and died Aft. 1940. She married WALTER A SABIN 20 Jun 1894 in Winchester/Garner MA. He was born Oct 1871 in NH, and died Aft. 1940.
i. EDWIN THOMAS9 SABIN, b. 19 Jul 1895, Gardner MA; d. Aft. 1930.
ii. ARTHUR SABIN, b. Abt. 1904, NH; d. Aft. 1910.
iii. RUTH MADALIN SABIN, b. 17 Jun 1905, Westminster VT; d. Aft. 1920. 144. FRANK BURLEIGH8 FRENCH (ANN J7 CONANT, LYDIA6 STONE, ABRAHAM5, SAMUEL4, JOSEPH3, SIMON2, SIMON1) was born 04 Aug 1868 in Templeton MA, and died Bet. 1898 - 1930. He married MARY EDITH MARBLE Abt. 1888, daughter of HORACE MARBLE and MARY ?. She was born Dec 1869 in Oxford MA, and died Aft. 1930.
i. VIVIAN LOIS9 FRENCH, b. 04 Jan 1899, Gardner MA; d. Aft. 1900. 145. IRENE MARY8 FRENCH (ANN J7 CONANT, LYDIA6 STONE, ABRAHAM5, SAMUEL4, JOSEPH3, SIMON2, SIMON1) was born 12 Sep 1873 in Templeton MA, and died Aft. 1940. She married HERBERT A TAYLOR 11 Jun 1896 in Templeton/Gardner MA. He was born May 1871 in Winchendon MA, and died Aft. 1940.
i. RUPERT NORMAN9 TAYLOR, b. 08 Apr 1898, Gardner MA; d. 11 Jan 1980, San Diego CA; m. ? ?, Later divorced. 146. FAYETTE CONANT8 BARTLETT (CARRIE BELLE7 CONANT, LYDIA6 STONE, ABRAHAM5, SAMUEL4, JOSEPH3, SIMON2, SIMON1) was born 23 May 1890 in Templeton MA, and died Aft. 1940. He married MARIA (MAUD) A MCGUINESS, daughter of MARY ?. She was born Abt. 1897 in MD, and died Aft. 1940.
i. LYNN9 BARTLETT, b. Abt. 1922, PA; d. Aft. 1940.
ii. BERTRAN BARTLETT, b. Abt. 1925, PA; d. Aft. 1940. 147. ORLANDO WHITE8 MASON (EMMA A7 WHITE, MIRIAM6 WALKER, DIADAMIA5 STONE, SAMUEL4, JOSEPH3, SIMON2, SIMON1) was born 17 Feb 1877 in Winchendon MA, and died Aft. 1940. He married EDITH F HUTCHINGS. She was born Abt. 1878 in CT, and died Aft. 1940.
i. HELEN H9 MASON, b. Abt. 1907, PA; d. Aft. 1920.
ii. ROBERT W MASON, b. Abt. 1908, PA; d. Aft. 1947; m. MARIAN HARVEY, 28 Dec 1947, Susquehanna PA.
iii. EMILY MASON, b. Abt. 1909, PA; d. Aft. 1920. 148. ROLAND KEYES8 PARKER (WILLIAM E7, EMILY6 WALKER, DIADAMIA5 STONE, SAMUEL4, JOSEPH3, SIMON2, SIMON1) was born 14 Sep 1887 in Haverhill MA, and died Aft. 1940. He married EDNA F YORK 09 Sep 1915 in West Boylston MA. She was born Abt. 1897 in MA, and died Aft. 1940.
i. WALLACE R9 PARKER, b. Abt. 1916, MA; d. Aft. 1940.
ii. HARRY C PARKER, b. Abt. 1919, MA; d. Aft. 1940. 149. AMOS CLAYTON8 PARKER (WILLIAM E7, EMILY6 WALKER, DIADAMIA5 STONE, SAMUEL4, JOSEPH3, SIMON2, SIMON1) was born 22 Aug 1885 in Haverhill MA, and died Aft. 1940. He married BERTHA E BLACKWELL 05 Apr 1913 in Revere MA. She was born Abt. 1882 in MA, and died Aft. 1940.
i. PAUL WILLIAM9 PARKER, b. 03 Oct 1914, Quincy MA; d. Aft. 1940.
ii. ALDEN B PARKER, b. Abt. 1918, MA; d. Aft. 1940. 150. LEON ARVINE8 GOODALE (NELLIE G7 MERRIAM, LUCY6 WALKER, DIADAMIA5 STONE, SAMUEL4, JOSEPH3, SIMON2, SIMON1) was born 01 Mar 1876 in West Boylston MA, and died Aft. 1940. He married ELSIE MAY PHELPS 29 Oct 1902 in Southborough MA. She was born Abt. 1880 in MA, and died Aft. 1940.
i. LOIS IRENE9 GOODALE, b. 20 Apr 1904, West Boylston MA; d. Aft. 1920.
ii. PAULINE EDNA GOODALE, b. 22 Apr 1907, West Boylston MA; d. Aft. 1920.
iii. EDITH L GOODALE, b. 11 Aug 1912, Worcester MA; d. Aft. 1930.
iv. ARNOLD P GOODALE, b. 10 May 1915, Worcester MA; d. Aft. 1940. 151. HATTIE LOUISA8 GOODALE (NELLIE G7 MERRIAM, LUCY6 WALKER, DIADAMIA5 STONE, SAMUEL4, JOSEPH3, SIMON2, SIMON1) was born 03 May 1883 in West Boylston MA, and died Aft. 1940. She married WALTER E ROBBINS 28 Jun 1905 in West Boylston MA. He was born Abt. 1884 in Worcester MA, and died Aft. 1940. 182. i. PAUL G9 ROBBINS, b. 03 Jun 1908, Worcester MA; d. 08 Dec 1989, North Adams MA. ii. WALTER ROBBINS, b. Abt. 1913, NJ; d. Aft. 1930.
iii. ADELE ROBBINS, b. Abt. 1914, NJ; d. Aft. 1930. 152. AARON8 GOODALE (NELLIE G7 MERRIAM, LUCY6 WALKER, DIADAMIA5 STONE, SAMUEL4, JOSEPH3, SIMON2, SIMON1) was born 24 Jun 1889 in West Boylston MA, and died Aft. 1940. He married (1) VELMA G ?. She was born Abt. 1893 in MA, and died Aft. 1940. He married (2) FANNIE BOND CONVERSE 24 Jun 1914 in Cambridge MA. She was born 05 Oct 1888 in Worcester MA, and died Bet. 1918 - 1920.
i. BARBARA E9 GOODALE, b. Abt. 1924, MA; d. Aft. 1940.
ii. MARTHA L GOODALE, b. Abt. 1928, MA; d. Aft. 1940.
iii. CHARLES E GOODALE, b. Abt. 1932, MA; d. Aft. 1940.
iv. AARON9 GOODALE, b. Abt. 1918, MA; d. Aft. 1930. 153. DWIGHT MERRIAM8 GOODALE (NELLIE G7 MERRIAM, LUCY6 WALKER, DIADAMIA5 STONE, SAMUEL4, JOSEPH3, SIMON2, SIMON1) was born 24 Aug 1897 in West Boylston MA, and died 22 Jan 1985 in Worcester MA. He married ELEANOR E ?. She was born Abt. 1896 in MA, and died Bet. 1930 - 1940.
i. JUNE E9 GOODALE, b. Abt. 1925, MA; d. Aft. 1940.
ii. RITH A GOODALE, b. Abt. 1928, MA; d. Aft. 1940.
iii. DWIGHT M GOODALE, b. Abt. 1930, MA; d. Aft. 1940. 154. FRANKLIN WALKER8 HOOPER (EDITH MAY7 WALKER, ALVA STONE6, DIADAMIA5 STONE, SAMUEL4, JOSEPH3, SIMON2, SIMON1) was born 06 Sep 1894 in Larchmont NY, and died Aft. 1940. He married MARY L ?. She was born Abt. 1893 in NY, and died Aft. 1940.
i. FRANKLIN W9 HOOPER, b. Abt. 1921, NY; d. Aft. 1940.
ii. ROBERT S HOOPER, b. Abt. 1928, NY; d. Aft. 1940. 155. ALVA S8 WALKER (FREDERICK H7, ALVA STONE6, DIADAMIA5 STONE, SAMUEL4, JOSEPH3, SIMON2, SIMON1) was born Oct 1897 in NY, and died Aft. 1940. He married BETHIAH ?. She was born Abt. 1900 in NY, and died Aft. 1940.
i. ELIZABETH MAY9 WALKER, b. Abt. 1923, NY; d. Aft. 1940.
ii. ALVA S WALKER, b. Abt. 1925, NY; d. Aft. 1940.
iii. EVELYN B WALKER, b. Abt. 1932, NY; d. Aft. 1940. 156. RICHARD H8 WALKER (FREDERICK H7, ALVA STONE6, DIADAMIA5 STONE, SAMUEL4, JOSEPH3, SIMON2, SIMON1) was born Abt. 1902 in NY, and died Aft. 1940. He married ELSIE ?. She was born Abt. 1906 in CT, and died Aft. 1940.
i. RICHARD A9 WALKER, b. Abt. 1934, NY; d. Aft. 1940.
ii. BRUCE H WALKER, b. Abt. 1939, NY; d. Aft. 1940. 157. MARTHA AGNES8 HOLBROOK (ERVIN D7, MARTHA WILDER6 WALKER, DIADAMIA5 STONE, SAMUEL4, JOSEPH3, SIMON2, SIMON1) was born 13 Jun 1884 in Gardner MA, and died Aft. 1940. She married ROLLIN ABELL 10 Nov 1903 in Boston MA - divorced. He was born 01 Feb 1880 in DC, and died Aft. 1940.
i. VIRGINIA MARTHA9 ABELL, b. 13 Sep 1904, Boston MA; d. Aft. 1940.
ii. HELEN HOLBROOK ABELL, b. 23 Oct 1905, Boston MA; d. Aft. 1930.
iii. ROLLIN WESTON ABELL, b. 18 Dec 1906, Boston MA; d. 22 Jan 1938, Cleveland OH. iv. JANICE ABELL, b. 07 Jan 1908, Boston MA; d. Aft. 1920.
v. FRANCES M ABELL, b. 22 Oct 1913, Milton MA; d. Aft. 1930.
vi. MARGERY ABELL, b. 30 Aug 1915, Milton MA; d. Aft. 1930. 158. FRANK ERVIN8 HOLBROOK (ERVIN D7, MARTHA WILDER6 WALKER, DIADAMIA5 STONE, SAMUEL4, JOSEPH3, SIMON2, SIMON1) was born 28 Sep 1885 in Holden MA, and died Aft. 1930. He married REVA MAY ATKINSON 30 Apr 1914 in Webster MA. She was born Abt. 1896 in AR, and died Aft. 1930.
i. SHIRLEY L9 HOLBROOK, b. Abt. 1924, MA; d. Aft. 1930. 159. WALTER GRANT8 HOLBROOK (ERVIN D7, MARTHA WILDER6 WALKER, DIADAMIA5 STONE, SAMUEL4, JOSEPH3, SIMON2, SIMON1) was born 12 May 1894 in Holden MA, and died Bet. 1930 - 1940. He married MARGARET M ?. She was born Abt. 1897 in MA, and died Aft. 1940.
i. BERNICE M9 HOLBROOK, b. Abt. 1919, CT; d. Aft. 1930.
ii. ROBERT J HOLBROOK, b. Abt. 1920, MA; d. Aft. 1940.
iii. RICHARD F HOLBROOK, b. Abt. 1923, MA; d. Aft. 1940.
iv. WILLIAM M HOLBROOK, b. Abt. 1923, MA; d. Aft. 1940. 160. RALPH EUGENE8 HOLBROOK (ERVIN D7, MARTHA WILDER6 WALKER, DIADAMIA5 STONE, SAMUEL4, JOSEPH3, SIMON2, SIMON1) was born 03 Jun 1897 in Worcester MA, and died Aft. 1940. He married JULIA E ?. She was born Abt. 1902 in MA, and died Aft. 1940.
i. CAROL A9 HOLBROOK, b. Abt. 1931, MA; d. Aft. 1940.
ii. RALPH HOLBROOK, b. Abt. 1934, MA; d. Aft. 1940.
iii. WILLIAM HOLBROOK, b. Abt. 1940, MA; d. Aft. 1940. 161. FLORENCE G8 HOLBROOK (WILLIAM LEVI7, MARTHA WILDER6 WALKER, DIADAMIA5 STONE, SAMUEL4, JOSEPH3, SIMON2, SIMON1) was born Abt. 1912 in MA, and died Aft. 1940. She married ? JERNBERG. i. CARL I9 JERNBERG, b. Abt. 1939, MA; d. Aft. 1940. 162. FRED THOMAS8 COMEE (SYLVESTER GRISWOLD7, CHRISTOPHER COLUMBUS6, MERRIAM5 STONE, SAMUEL4, JOSEPH3, SIMON2, SIMON1) was born 27 May 1897 in Minneapolis MN, and died Aft. 1940. He married ELEANOR ?. She was born Abt. 1901 in MN, and died Aft. 1940.
i. ROBERT A9 COMEE, b. Abt. 1926, MN; d. Aft. 1940.
ii. RICHARD F COMEE, b. Abt. 1927, MN; d. Aft. 1940.
iii. PATRICIA L COMEE, b. Abt. 1928, MN; d. Aft. 1940. 163. MYRON FREDERICK8 LESLIE (MARTHA J7 COMEE, SAMUEL S6, MERRIAM5 STONE, SAMUEL4, JOSEPH3, SIMON2, SIMON1) was born 05 Sep 1885 in MN, and died Aft. 1940. He married CLARA R ?. She was born Abt. 1887 in ND, and died Aft. 1940.
i. MYRON W9 LESLIE, b. Abt. 1916, MN; d. Aft. 1940.
ii. CHARLES B LESLIE, b. Abt. 1923, MN; d. Aft. 1940. 164. CLIFFORD WESLEY9 SAUNDERSON (JACOB WESLEY W8 SANDERSON, CATHERINE AUGUSTA7 STONE, NELSON6, EUNICE5, SAMUEL4, JOSEPH3, SIMON2, SIMON1) was born 03 Jul 1894 in Phillipston MA, and died 03 Feb 1982 in Parma OH. He married (1) CARLENE J ?. She was born Abt. 1901 in MA, and died Aft. 1920. He married (2) MYRA W ?. She was born Abt. 1899 in MA, and died Aft. 1940.
i. CARLENE W10 SAUNDERSON, b. Abt. 1919, MA; d. Aft. 1920.
ii. CLIFFORD W10 SAUNDERSON, b. Abt. 1929, OH; d. Aft. 1940.
iii. JUDITH SAUNDERSON, b. Abt. 1931, OH; d. Aft. 1940. 165. MARGARET MONA9 WESCOTT (ANNA EVELYN8 SMART, (HATTIE) ELLA MARIA7 STONE, ANDREW JACKSON6, EUNICE5, SAMUEL4, JOSEPH3, SIMON2, SIMON1) was born 30 Apr 1906 in Cambridge MA, and died Aft. 1940. She married ? COSTELLO. i. DIANNE A10 COSTELLO, b. Abt. 1932, MA; d. Aft. 1940. 166. CARLOS ARTHUR9 AVERY (AMOS FRANKLIN8, MARY ANN7 STONE, JOSEPH6, SAMUEL5, SAMUEL4, JOSEPH3, SIMON2, SIMON1) was born 09 May 1907 in MN, and died 09 May 1976 in Pope MN. He married FLORENCE W SEELEY. She was born Abt. 1915 in WI, and died Aft. 1950.
i. CARLOS PRESTON10 AVERY, b. 07 Nov 1938, McLeod MN; d. Aft. 1940.
ii. MARK ALLAN AVERY, b. 30 Jun 1942, Kandiyohi MN. iii. STEPHEN LEE AVERY, b. 28 Jun 1950, Pope MN. 167. PAUL JAMES9 STONE (JUDSON NORTON8, FRANKLIN7, REUBEN6, JOSIAH5, SAMUEL4, JOSEPH3, SIMON2, SIMON1) was born 07 Jun 1914 in Oberlin OH, and died 02 Feb 1999 in Lorain OH. He married INA ESTHER LAHTI. She was born 12 Oct 1913 in WA, and died 02 Jun 2011 in Lorain OH. i. PAULA J10 STONE, d. Aft. 1999. 168. DOROTHY H9 STONE (JUDSON NORTON8, FRANKLIN7, REUBEN6, JOSIAH5, SAMUEL4, JOSEPH3, SIMON2, SIMON1) was born 28 May 1916 in OH, and died 17 Aug 2011 in Ashland OH. She married DONALD S ROBINSON. He was born 10 Jul 1905 in OH, and died 14 Jul 1985 in Lorain OH. i. LYNNE CAROL10 ROBINSON, b. Abt. 1939, OH; d. Aft. 1940. 169. CHARLES W9 STONE (JUDSON NORTON8, FRANKLIN7, REUBEN6, JOSIAH5, SAMUEL4, JOSEPH3, SIMON2, SIMON1) was born 28 Sep 1894 in Oberlin OH, and died Aft. 1940. He married RACHEL B WALKDEN 19 Jun 1918 in Cuyahoga OH. She was born Abt. 1896 in OH, and died Aft. 1940.
i. DONNABEL F10 STONE, b. Abt. 1920, OH; d. Aft. 1940.
ii. KENNETH STONE, b. Abt. 1922, OH; d. Aft. 1940.
iii. DORIS STONE, b. Abt. 1932, OH; d. Aft. 1940. 170. ROBERT JOHN9 STONE (JUDSON NORTON8, FRANKLIN7, REUBEN6, JOSIAH5, SAMUEL4, JOSEPH3, SIMON2, SIMON1) was born 13 Nov 1897 in Oberlin OH, and died 05 Nov 1983 in Berea OH. He married LOUISE M PARK. She was born 1897 in IL, and died 1992.
i. BETTY10 STONE, b. Abt. 1923, IA; d. Aft. 1983; m. ? CARLEY. 171. ROY EMERSON9 STONE (EMERSON ERASTUS8, FRANKLIN7, REUBEN6, JOSIAH5, SAMUEL4, JOSEPH3, SIMON2, SIMON1) was born 01 Jul 1887 in MO, and died 21 Nov 1955 in Napa CA. He married HAZEL L ROBERTSON 06 Dec 1910 in Fresno CA- later divorced. She was born Abt. 1891 in CA, and died Aft. 1940.
i. GERALDINE M10 STONE, b. 19 Aug 1913, Stanislaus CA; d. Aft. 1930.
ii. BARBARA L STONE, b. Abt. 1915, CA; d. Aft. 1930. 172. VIOLA LENORA9 STONE (EMERSON ERASTUS8, FRANKLIN7, REUBEN6, JOSIAH5, SAMUEL4, JOSEPH3, SIMON2, SIMON1) was born May 1889 in MO, and died Aft. 1930. She married ROD EDWARD TIERNAN 22 Apr 1916 in Stanislaus CA. He was born 28 Aug 1891 in Fresno CA, and died 15 Jan 1976 in Contra CA. i. ROD E10 TIERNAN, b. 08 Jan 1920, Fresno CA; d. Aft. 1930.
ii. EMMA JEAN TIERNAN, b. 22 May 1923, Fresno CA; d. Aft. 1930.
iii. FRANK E TIERNAN, b. Abt. 1925, CA; d. Aft. 1930. 173. EILEEN GRACE9 STONE (EMERSON ERASTUS8, FRANKLIN7, REUBEN6, JOSIAH5, SAMUEL4, JOSEPH3, SIMON2, SIMON1) was born 26 Nov 1891 in MO, and died 12 Oct 1984 in Stanislaus CA. She married LLOYD VERNON HINTON 11 Jun 1917 in San Joaquin CA - later divorced. He was born Abt. 1896.
i. MARGARET M10 HINTON, b. 14 Jun 1920, Alameda CA; d. Aft. 1930. 174. CHARLES HAROLD9 STONE (EMERSON ERASTUS8, FRANKLIN7, REUBEN6, JOSIAH5, SAMUEL4, JOSEPH3, SIMON2, SIMON1) was born 12 May 1894 in Nelson NE, and died 27 Apr 1967 in San Francisco CA. He married FLORENCE MARIAN PFLAGING 22 Nov 1916 in San Joaquin CA. She was born 27 Jul 1894 in CA, and died 03 Feb 1969 in Stanislaus CA. i. BETTY A10 STONE, b. Abt. 1921, CA; d. Aft. 1940.
ii. BEVERLEY JANE STONE, b. 23 Mar 1927, Stanislaus CA; d. Aft. 1940. 175. JUDSON NORTON9 STONE (EMERSON ERASTUS8, FRANKLIN7, REUBEN6, JOSIAH5, SAMUEL4, JOSEPH3, SIMON2, SIMON1) was born 05 Jun 1900 in MO, and died 01 Apr 1972 in Stanislaus CA. He married ELMA FERN BUCHANAN. She was born 08 May 1901 in Packwood IA, and died 13 Apr 1987.
i. JUDSON NORTON10 STONE, b. 26 Sep 1925, Stanislaus CA; d. 11 Dec 1993, Santa Barbara CA. ii. ROBERT VERNON STONE, b. 01 May 1929, Stanislaus CA; d. Aft. 1940. 176. STEPHEN WESLEY9 HAYNES (WILLIS REUBEN8, REUBEN WESLEY7, REUBEN6, MARTHA5 STONE, SAMUEL4, JOSEPH3, SIMON2, SIMON1) was born 02 Sep 1892 in Leominster MA, and died 07 Nov 1983 in Fitchburg MA. He married EVELYN ?. She was born Abt. 1894 in MA, and died Aft. 1940.
i. BARBARA10 HAYNES, b. Abt. 1926, MA; d. Aft. 1940.
ii. NORMA HAYNES, b. Abt. 1932, MA; d. Aft. 1940. 177. RUTH LOUISE9 POWERS (MINOT LEGATE8, EZRA WILLIS7, MARY6 HAYNES, MARTHA5 STONE, SAMUEL4, JOSEPH3, SIMON2, SIMON1) was born 14 Jul 1913 in Leominster MA, and died Aft. 1920. She married ? GREENE. i. LOUISE A10 GREENE, b. Abt. 1938, MA; d. Aft. 1940. 178. GUY LEWIS9 MILLER (MAUDE ISABEL8 HAYWARD, JONAS P7, MARY S6 PATCH, MARY5 STONE, SAMUEL4, JOSEPH3, SIMON2, SIMON1) was born 14 Sep 1895 in Westminster MA, and died Sep 1968 in Worcester MA. He married CORA D ?. She was born Abt. 1897 in MA, and died Aft. 1940.
i. HARRIET10 MILLER, b. Abt. 1923, MA; d. Aft. 1940.
ii. ELIZABETH MILLER, b. Abt. 1926, MA; d. Aft. 1940.
iii. HAROLD K MILLER, b. Abt. 1929, MA; d. Aft. 1940.
iv. RICHARD H MILLER, b. Abt. 1936, MA; d. Aft. 1940. 179. HARRY WELLMAN9 GREENOUGH (EMMA LOUISA8 FISH, LYRA MARIA7 HAYWARD, MARY S6 PATCH, MARY5 STONE, SAMUEL4, JOSEPH3, SIMON2, SIMON1) was born 05 Apr 1907 in Lunenburg MA, and died Aft. 1940. He married DORIS ?. She was born Abt. 1910 in OH, and died Aft. 1940.
i. HARRY10 GREENOUGH, b. Abt. 1930, MA; d. Aft. 1940. 180. ELMER MAURICE9 GREENOUGH (EMMA LOUISA8 FISH, LYRA MARIA7 HAYWARD, MARY S6 PATCH, MARY5 STONE, SAMUEL4, JOSEPH3, SIMON2, SIMON1) was born 29 Apr 1910 in Leominster MA, and died Aft. 1930. He married GERDA O ?. She was born Abt. 1913 in MA, and died Aft. 1930.
i. EDWARD E10 GREENOUGH, b. Abt. 1930, MA; d. Aft. 1930. 181. HERMAN E9 GREENOUGH (EMMA LOUISA8 FISH, LYRA MARIA7 HAYWARD, MARY S6 PATCH, MARY5 STONE, SAMUEL4, JOSEPH3, SIMON2, SIMON1) was born 30 Nov 1911 in MA, and died 08 May 1997 in Roverside CA. He married MARGUERITE ?. She was born Abt. 1915 in MA, and died Aft. 1940.
i. NORMAN10 GREENOUGH, b. Abt. 1933, MA; d. Aft. 1940.
ii. ROGER GREENOUGH, b. Abt. 1934, MA; d. Aft. 1940. 182. PAUL G9 ROBBINS (HATTIE LOUISA8 GOODALE, NELLIE G7 MERRIAM, LUCY6 WALKER, DIADAMIA5 STONE, SAMUEL4, JOSEPH3, SIMON2, SIMON1) was born 03 Jun 1908 in Worcester MA, and died 08 Dec 1989 in North Adams MA. He married IRENE ?. She was born Abt. 1908 in NJ, and died Aft. 1940.
i. BARBARA LYNN10 ROBBINS, b. Abt. 1937, NJ; d. Aft. 1940.